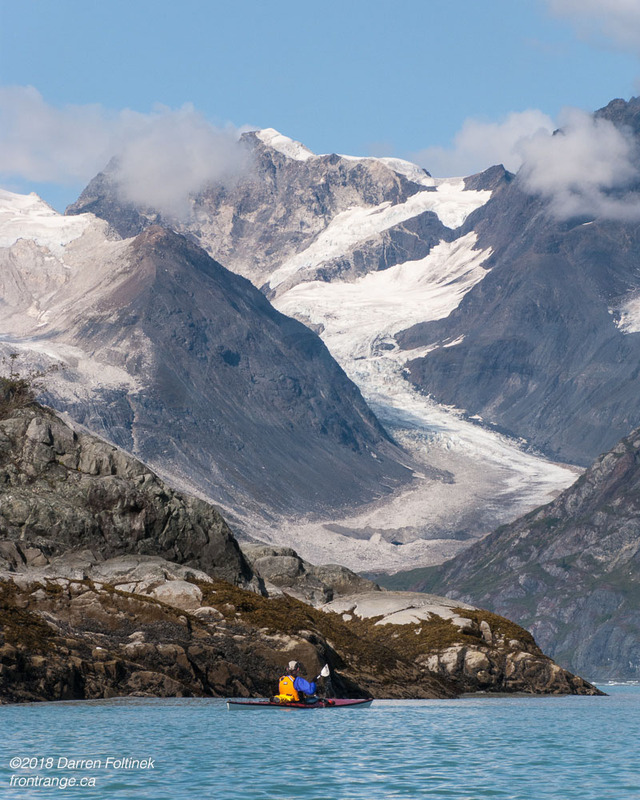 Glacier Bay National Park is at the southern end of the St. Elias Mountains, in south-east Alaska. It was established as a National Park only in 1980, after being designated a National Monument in 1925. 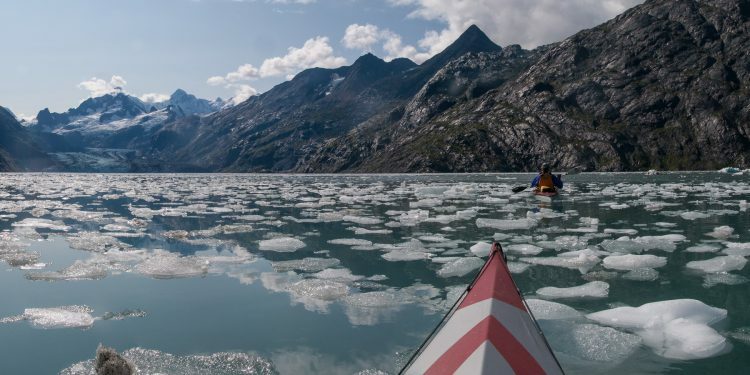 In 1992 UNESCO designated Glacier Bay a World Heritage Site, as part of the 98,000 km2 Kluane / Wrangell – St. Elias / Glacier Bay / Tatshenshini-Alsek region that straddles the US / Canada border, the largest protected land area in the world. 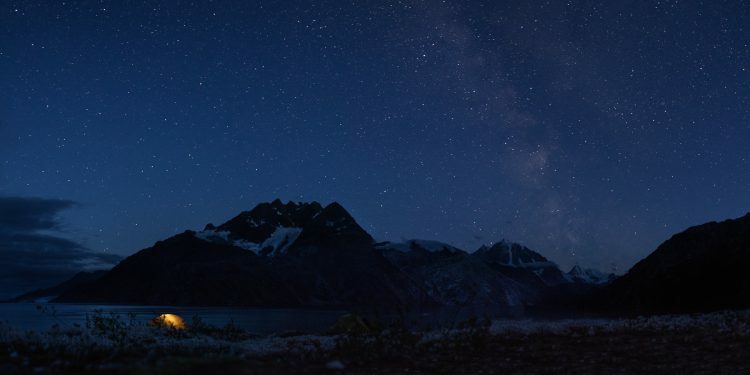 This region includes some of highest mountains in North America, 1,900km of coastline, the largest non-polar icefields in the world, and some of the most pristine wilderness remaining on Earth. 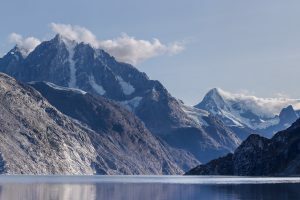 The Fairweather range rises to 4600m above the ocean to the east of the bay, and that wall of mountains traps Pacific storms, causing them to dump massive amounts of moisture in the mountains, which falls as snow most of the year. 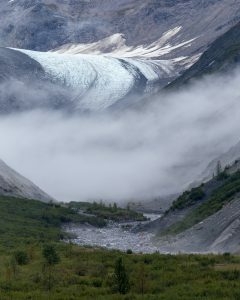 That snow turns into ice and glaciers, and the St. Elias mountains are home to some of the largest icefields in the world. 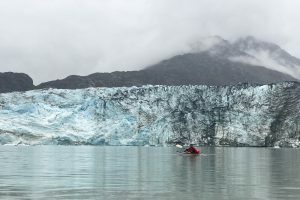 Glaciers are very sensitive to temperature changes, and Glacier Bay has seen some of the most dramatic changes in ice cover in the world, as the glaciers have advanced and retreated 100km over the last 400 years. 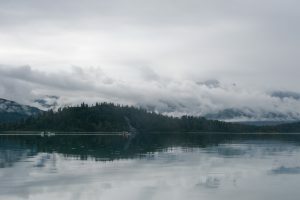 The Tlingit people (“people of the tide”) have inhabited the area for countless centuries, including having an established village at the current mouth of the bay before the glaciers descended during the 1700s, destroying the village and rich tidal flat, and displacing the people across Icy Straight to the village of Hoonah. The Tlingit returned officially to their homeland in a 2016 Huna Tribal House dedication ceremony. The earliest written history of the region is from the 1741 Russian expedition of Vitus Bering and Aleksei Chirikov. In 1794, on the final summer of George Vancouver’s epic 4-year circumnavigation of the globe, it was reported that this part of the coast was blocked by a wall of ice. 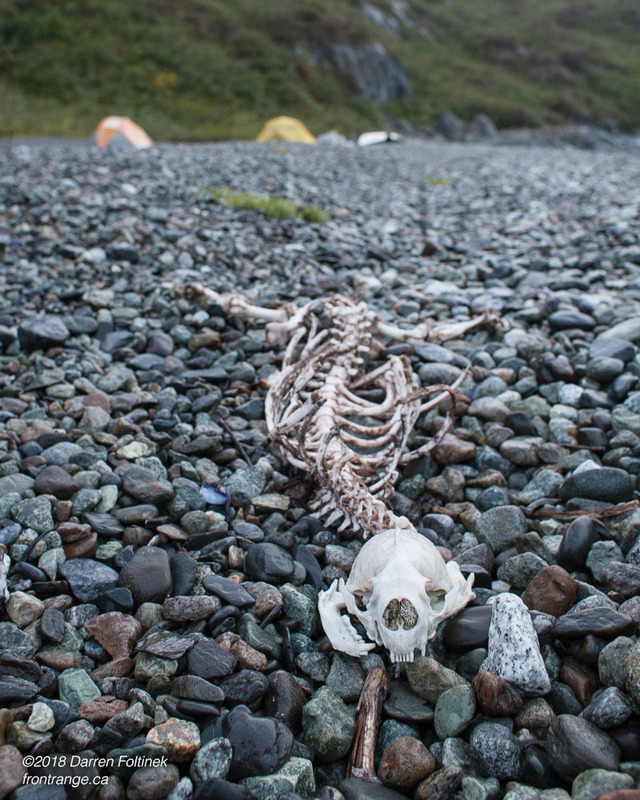 This was just after the estimated 1750 maximum extent of the glaciers in the bay. In the late 1800s, gold rush miners came to the area, establishing a salt mine at Barlett Cove in the 1890s. 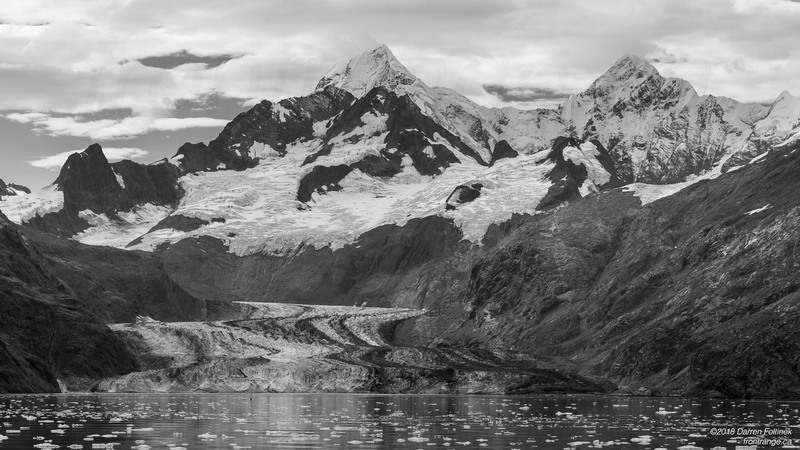 By 1888, when naturalist John Muir first explored the bay, the glacier that had extended all the way to the coast in 1794 had already retreated about 70km inland. The first tourist ship arrived in 1893, and today around 500,000 people a year visit the park, the vast majority by cruise ship, many by ferry and tour boat, and quite a few by kayak. The Alaska Marine Highway ferry stops at the town of Gustavus, and from there it’s about 13km to Barlett Cove, where there is the historic Glacier Bay Lodge, a beautiful campsite, a National Park Service office and a boat dock. Glacier Bay runs a fantastic boat tour of the bay, with friendly crew, interesting talks by park wardens, a great lunch, and is equipped to drop off and pick up kayak groups. We wake at 5 to get to the dock, assemble the kayaks and have all of our gear piled up and ready to go by 6:30. The morning sky is heavy overcast and misty, but it’s not bad and doesn’t really count as rain. 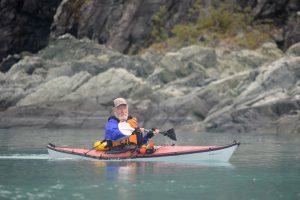 We load our boats and gear on the big catamaran tour boat, along with fellow paddlers Jim from Oregon and Vivian from Calgary, who will be in the east (Muir) arm this week, plus about 80 other folks who are out for a day trip. Two sisters from New Zealand are reenacting a trip their mom did in the 80s, a bunch of adventurous retired folks, a family with three kids from New Jersey, some Chinese with their guide, some Germans and French, and more. As we are waiting in the boat for the 7:30 departure the mist turns to rain, gently at first then a hard rain, and all the soggy and hooded folks stream onto the ship. The rain is really coming down as we slowly pull out of the harbor into the foggy channel. Water below, cloud above and fog all around, so there’s not much to see until we get to the South Marble island, which is covered in sea lions and birds, including puffins. The boat continues on to Mt Wright, at the mouth of the east arm, to drop Jim and Vivian off. 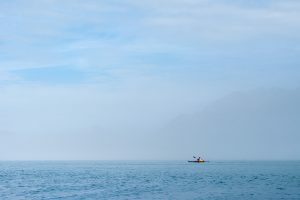 The process is very entertaining for everyone, as the ship pulls up to a sandy beach, lowers a ladder, the paddlers climb down, all their gear and kayaks are passed down to them, and we sail off, leaving them alone in the foggy wilderness. As we sail up the west arm toward Tarr Inlet the rain continues coming down hard. The one kiwi gal, who’s shooting film with a Pentax K1000, gets the full experience by standing out in the driving rain on the upper deck in socks. The clouds slowly lift and the rain eases off as we go up Tarr inlet until, fantastically, the rain stops when we are in front of Margerie glacier. 1000s of photos are taken of the fantastic broken wall of ice that flows down from cloud-shrouded mountains above. 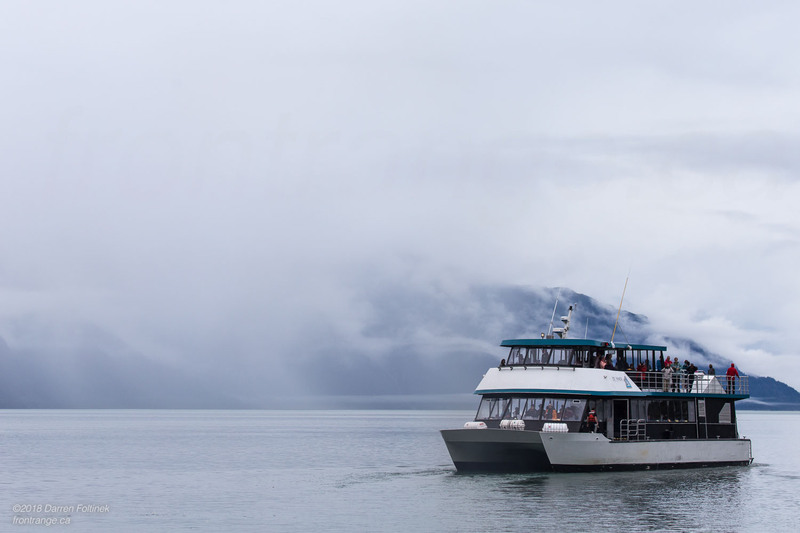 We then turn around and head over to Jaw Point at the head of John Hopkins inlet, the furthest that tour boats are allowed to go. A stunning place, and we are looking forward to being back here, under our own power, in a few days. 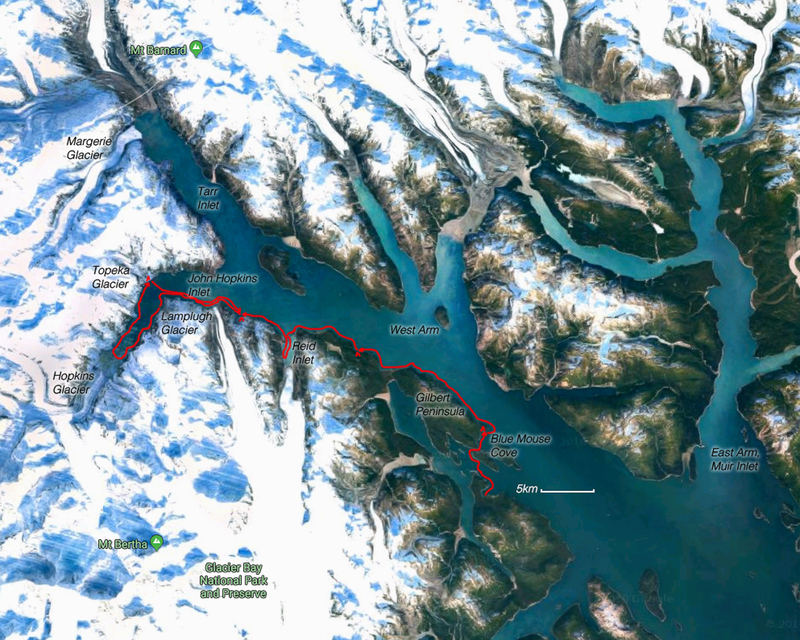 The tour boat heads back out the inlet, stops at Lamplugh Glacier and Reid inlet, passes our pickup point at Ptarmigan creek, then continues on to Sundew, our drop off point. We pull up to the beach, say goodby to new friends, then climb down the ladder and pile our gear and boats on the beach. The boat pulls off with lots of waves from everybody and we are left alone in the silence of this astonishing wilderness. After repacking the gear and setting up the boats we are off into the glassy-smooth water in Sundew. There are porpoises and seals showing themselves occasionally and light rain – a beautiful start! 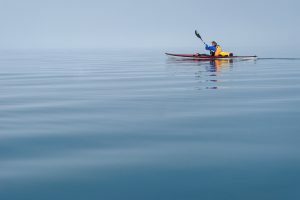 As we paddle out and head NW the rain continues lightly, but no wind disturbs the glassy water and all is calm and silent. It’s late afternoon as we approach Blue Mouse Cove, so we start to look for campsites along the shore. 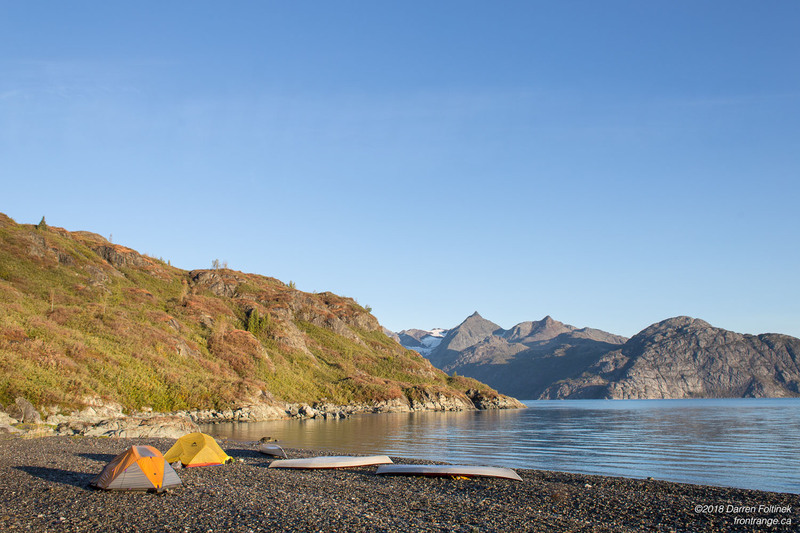 We find a couple suitable ones, but end up picking a rocky point that has three spots barely big enough for tents because of it’s spectacular location. The light rain has stopped by the time we make dinner of mashed potatoes with brussel sprouts and gravy, with a bit of wine on the side. A whale surfaces in the strait, just off our point campsite, and continues up the inlet. Seals and a sea otter also surface in the calm water of the cove, and there are loons, gulls, tarns and other birds flying about. 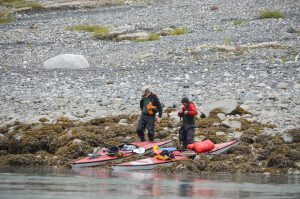 Tides will be playing a big part in our world this week, as we need to set up camp above the high tide, plan any crossing of the fjord around slack tide (when the water is calmest), ideally land boats on shore close to high tide to minimize carrying of gear up a long beach, be aware of tidal currents, and schedule paddling up and down inlets to coincide with rising and falling tides. It’s common understanding that the tides on Earth are caused by the gravitational attraction of the Moon and the Sun. But if you study the tide chart, you’ll see that there are two low tides and two high tides every day. Well, not quite everyday; the 2nd low tide of the day comes about 13 hours after the first one. First mystery: if the high tide is caused by the moon pulling on the ocean, why are there two high tides (almost) every day? The rise and set of the moon is just caused by the Earth’s rotation, once every 24 hours. If the tide was caused by the moon pulling on the ocean, then there should be one high tide roughly every 24 hours. 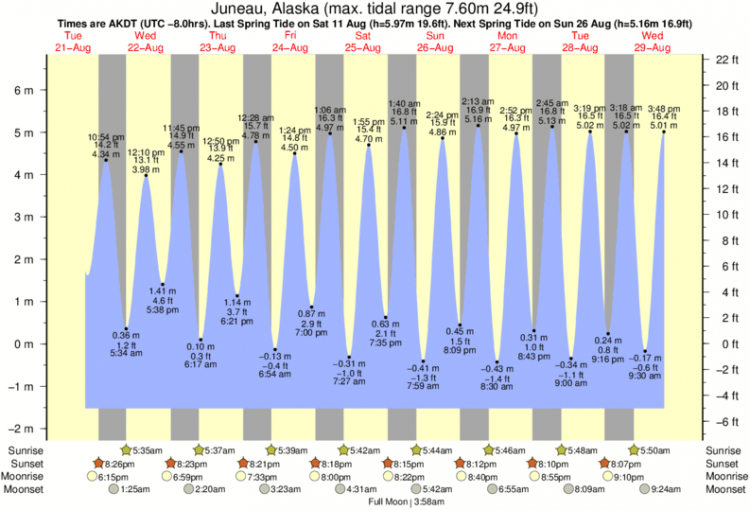 Second mystery: looking at the tide chart, you will notice that the high tides alternate heights. The odd ones are higher than the even ones, but both the big-high tide and the small-high tide are following a generally increasing trend. The same pattern applies to the low tides; every 2nd low tide is either really-low or not-so-low, and they too are following a slow trend. 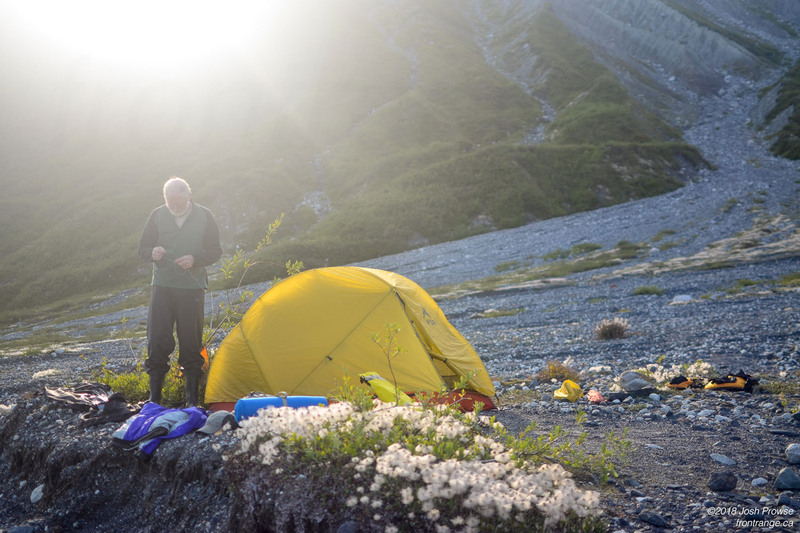 I’m wake at 4am to the sound of water lapping gently at rocks only a few meters from the tent. I know that we’ve set the tents, boats and food well above high tide, but I’m unable to go back to sleep until verifying that the ocean is not about to swallow our camp! After checking on the tide situation I lay awake pondering the rhythm of tides and come up with a possible answer to why there two tides a day and why the low tides alternate heights every 2nd tide, before falling back to sleep. 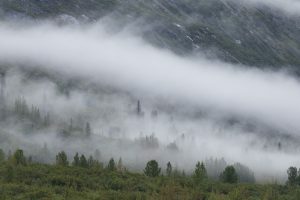 Up again at 7 and the morning is calm with mostly cloudy skies and a band of fog lying on the water to the south, towards Gustavus. The fog lying low on the water to the south has been moving up the inlet all morning, and by the time we have breakfast, take apart camp and pack the boats, the fog has drifted in to our little cove. 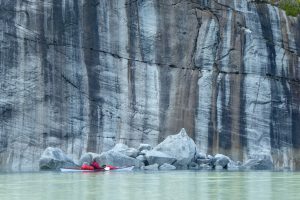 Once we paddle past the rocky point and into the main inlet, the water becomes glassy smooth and everything is absolutely calm and quiet. We are immersed in a world of water, with the mirror ocean below reflecting the subtle shades of sky and fog surrounding us. The only sound is the drip of water coming off the paddles with every stroke. Magic. 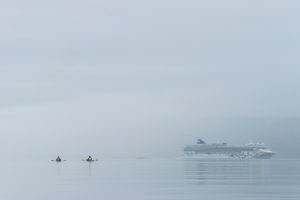 The fog slowly lifts as we continue west, past two rocky points after a tide channel at the north end of Scidmore Bay. 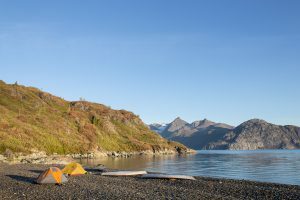 This stretch of shore is mostly rocky, with only occasional beaches, here we find a long beach with a stream at one end: looks like a good camp site. 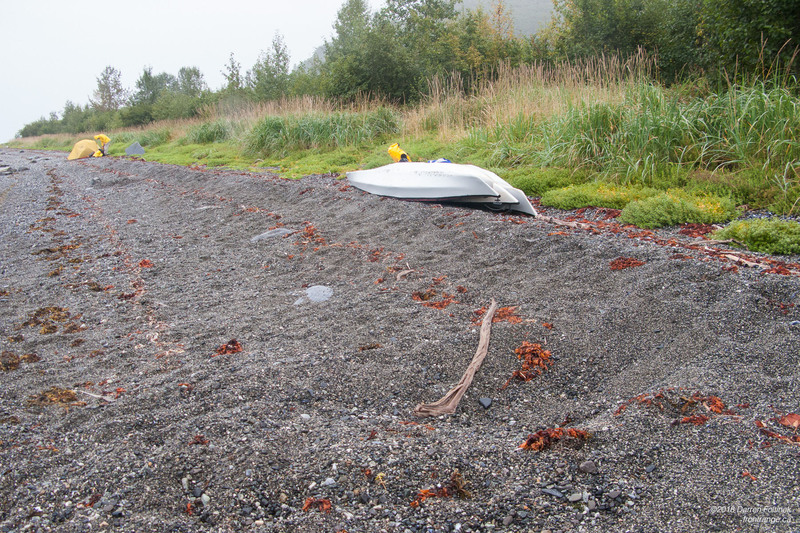 There’s a good chance that there are salmon in the stream, and where there are salmon there are bears, so we decide to give the stream wide clearance and head to the west end of the beach to look for a campsite. 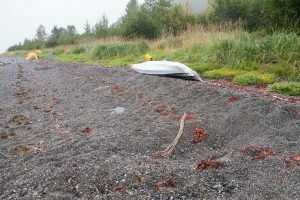 After landing the boats we discover that the beach is not much taller than the high-tide line, and so we walk into the brush above the tide line, looking for a higher camp spot, and find an enormous strawberry patch, 100m long, that’s completely trampled down, no doubt by bears. On the beach is a big pit in the gravel, also very likely dug by a bear. Camping in the bear’s strawberry patch seems like a very bad idea, while camping on the beach just barely above the high tide line is only marginally more attractive. As long as there’s no big storm tonight, the tides should be OK, and we set up camp as high as we can on the beach. The evening is beautiful, completely calm with only a few clouds in the sky. A humpback whale appears in the inlet, announcing itself with an explosive exhale, and continues west, with few more loud exhales, before doing a big back arch and raising its tail before doing a deep dive. 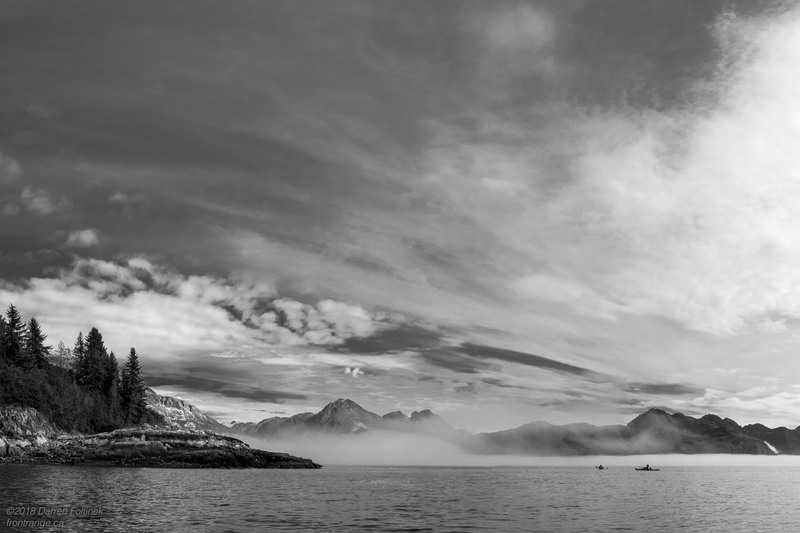 For several minutes the inlet is quiet, and then the whale reappears perhaps half a kilometer further up the inlet with another explosive breath. After dinner of couscous and vegetables we fetch water from the stream about 300m east along the beach. The sun drops behind the ridge to the west and the evening slowly turns into beautiful and calm twilight. Around 9:30 it’s getting dark. Jim and Josh have gone to bed and I’m sitting on a rock a few meters from my tent writing this journal when I hear a loud snort. Thinking it’s a seal, I turn around and lo, there’s big Alaska brown bear walking up the beach, about 100m away. I get up, say hi to the bear, and walk slowly away, towards our tents, saying loudly to the guys that we have a bear and they need to get up. We continue talking loudly as the bear slowly ambles up the beach towards us. The tide is low, and so the beach is wide, with maybe 40m between our tents and the water. 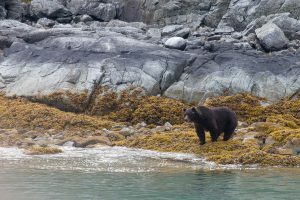 The bear pauses several times to sniff among the beach rocks and occasionally looks at us, but never comes closer than 30m as she walks past us and continues east up the shore. Ok, phew, that was exciting but everybody remained calm and there was no problem. A few minutes later we see another bear, coming up the beach following the first on: apparently we’re camped on a bear highway. This bear walks west, up the beach towards us, very close to shore, and is beautifully silhouetted against the still bright ocean. 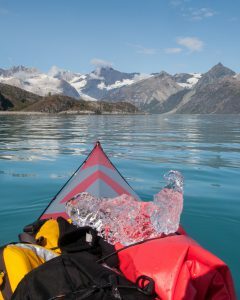 How I wish I had the camera, but it’s 5m away in my tent, and I have a bear spray in one hand and a paddle in the other. Argh, the best photo I never took! Bear #2 pauses several times to look at us, walks past us to the end of the beach, where the gravel ends and there are large rocks, sniffs around, comes back towards us, and then digs a pit in the gravel. 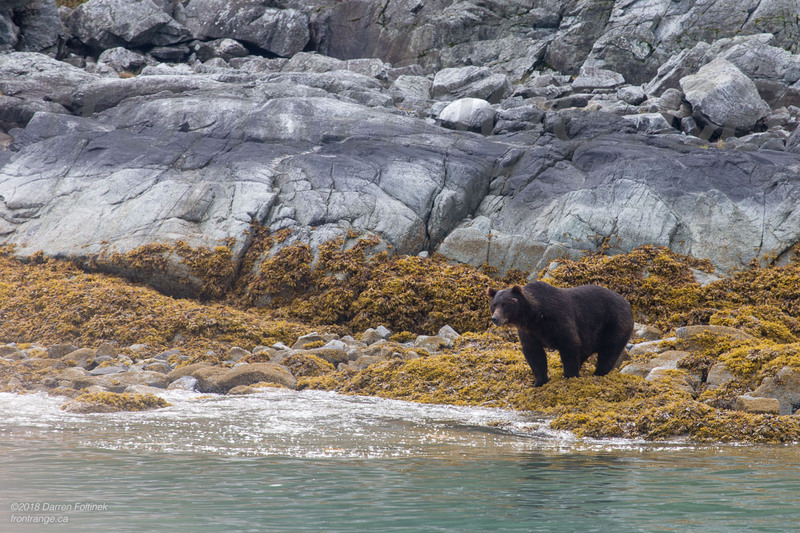 The bear continues to slowly wander about, walking back to the shore, then towards our tent (the safety comes off the bear spray), and generally checks the place out, pausing several times to look straight at us. Meanwhile are talking loudly and yelling at the bear, trying to persuade the bruin that he has better places to be. Finally goes back to his gravel pit and lies down in it, apparently bedding down for the night. He’s only about 20m away from our tents, a little too close for comfort! It’s mostly dark now and we lose sight of him among the big rocks next to the ocean. Occasionally we can see his eyes reflecting bright green at us, but he’s not moving any further away. The bear has been stubborn about claiming his beach, but not at all aggressive, threatening, or excessively curious towards us. We continue discussing what to do. Clearly he wants to spend the night here, and we decide that the safest, least confrontational option is for us to move our tents down the beach and give the bear more space. Done. Hopefully now three humans and one urs can all get a good night’s sleep. An absolutely magical encounter with these immensely powerful but generally peaceful giants! Up at 8 this morning after the negotiation session with the bear last night. Everybody slept OK, hopefully including the bear, who made a new sleeping pit even closer to our tents, very close to our kayaks. This is clearly his beach, and he was determined to spend the night here. We are just grateful that he allowed us to camp here as well. 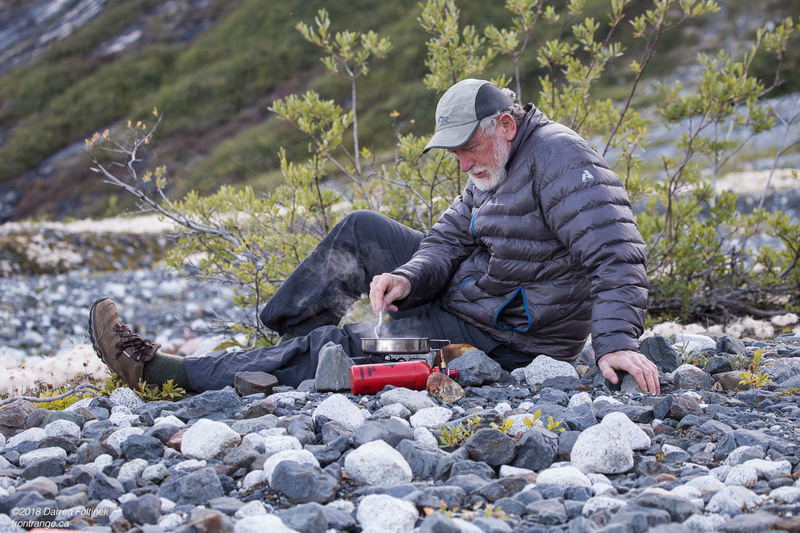 The bears have moved on, and we have a relaxed morning making breakfast and packing up camp, under a sky heavy with clouds and mist that soon turns to light rain. A whale blows a few times and then dives, and then breaches! 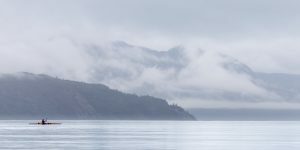 The fog and rain are like a heavy, wet blanket draped over the world, but once we are on the water all is good, and the rain is no issue. 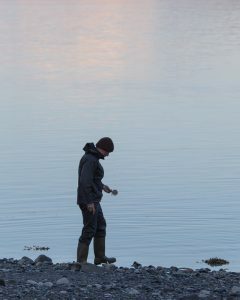 Again, the water is beautifully calm, as we are leaving camp during slack tide and there is no wind. The two daily cruise ships have already gone past us, followed by the tour boat, but that is all the ship traffic we see today. As we paddle west through the cloud and fog, our first stop is Reid inlet, which contains a tidewater glacier at it’s head. 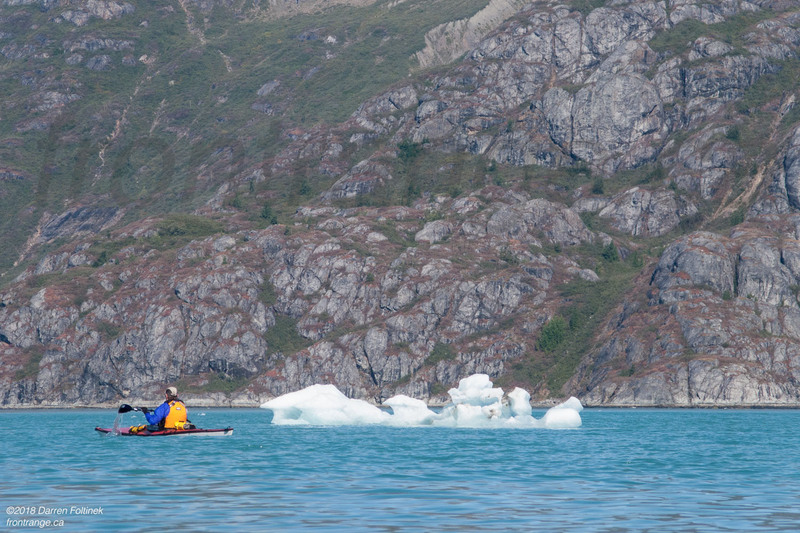 After a quick and chilly lunch stop on a tidal bar, we paddle up the inlet towards the glacier itself. 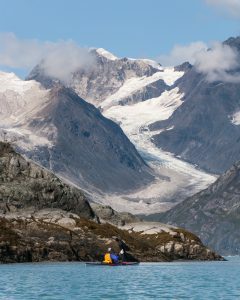 The inlet is larger than expected, and it takes us about 1/2 hour to get to the glacier, another 1/2 hour taking photos, and a 1/2 hour out. 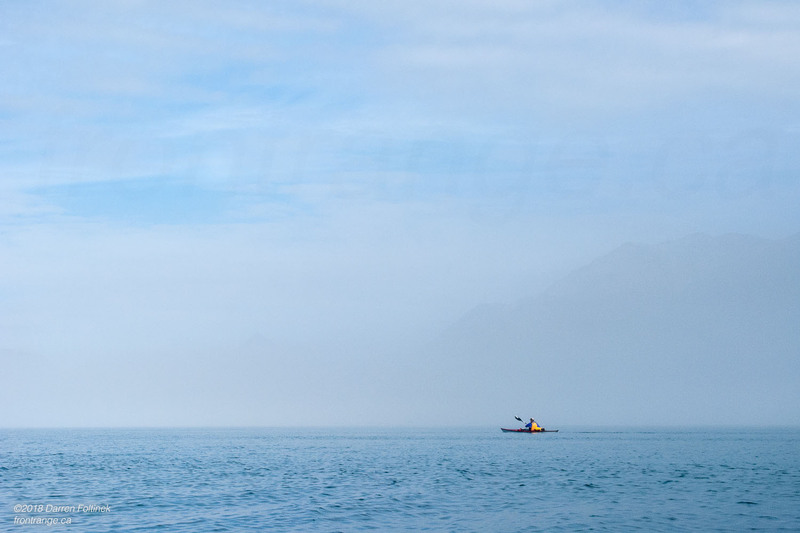 The inlet is very calm and quite cold, with an eerie and other worldly look to it. 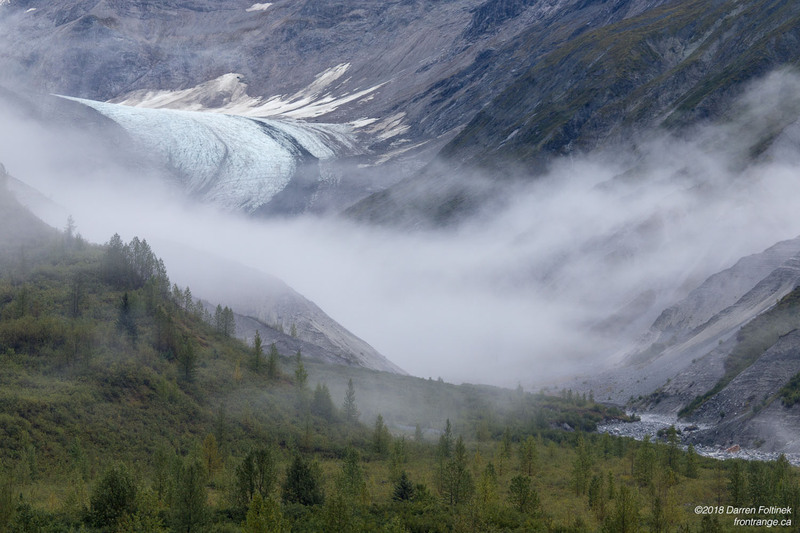 The clouds spilling over the ridge to the west, the receded glacier at the end of the valley, with the mess of broken clouds above, all back-lit by the sun, give the place an ancient and primeval feel. 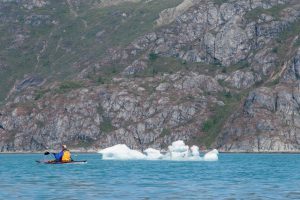 The water is a stunning turquoise blue, a little choppy from some wind near the glacier, but smooth at the mouth of the inlet. We leave this eerie inlet and work our way west toward today’s destination, now about 5km away. Once again the water is glassy smooth and the paddling is very easy. The weather so far has been remarkably good, with only a bit of rain and almost no wind, and we are all feeling very lucky after experiencing the downpour on the boat ride out here two days ago! Today was a short, mellow day of paddling. We all got chilled in Reid inlet, which was noticeably colder than the main inlet, likely just from the cold air flowing off the glacier. It’s quick to warm up when you’re wearing non-breathable rubberized paddling gear though. 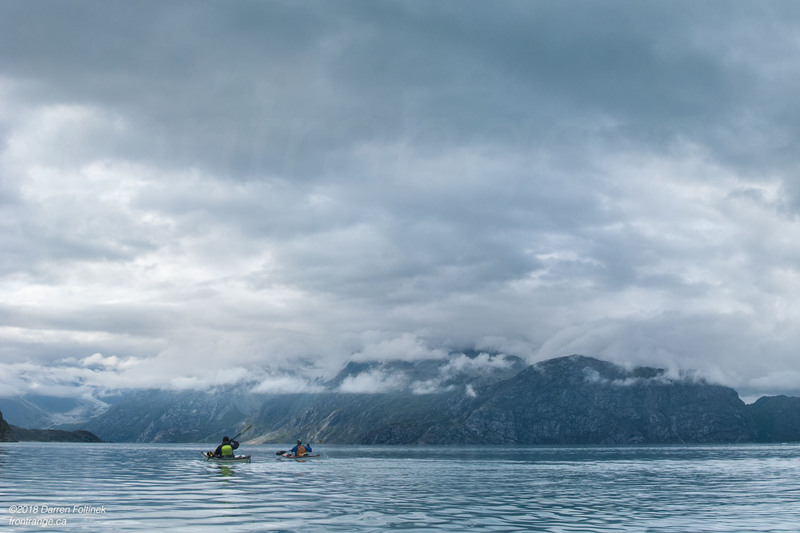 The low overcast sky, fog and rain gave the day a closed in, heavy, wet feeling, and we are happy to get out of the boats and set up camp. Ptarmigan Creek is a long beach of gravel, rock and sand made up of three tiers. It appears to be an old lateral moraine that the tides have sloped into a smooth beach, with a channel cut into it by a stream at the east end. 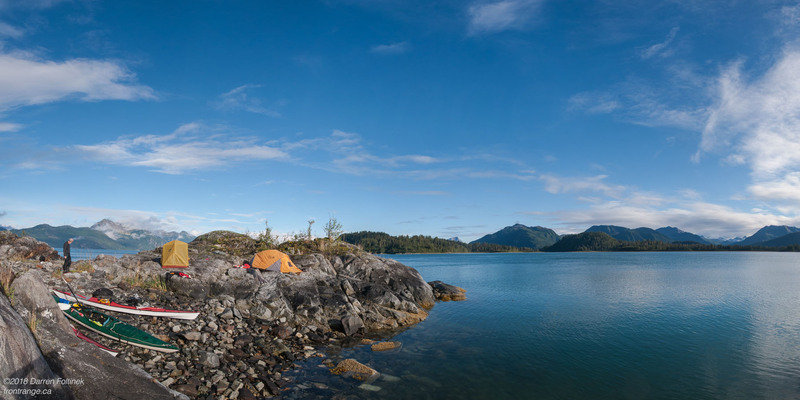 It’s an excellent camp spot, with a wide, flat and smooth rocky bench well above high tide. Most importantly, there is lots of room for bears to wander through without coming too close and making the other species nervous! Hopefully we have an uneventful evening, free of big hairy visitors. The clouds have been heavy and low all day, but thankfully it’s not raining on us as we set up camp and make dinner. 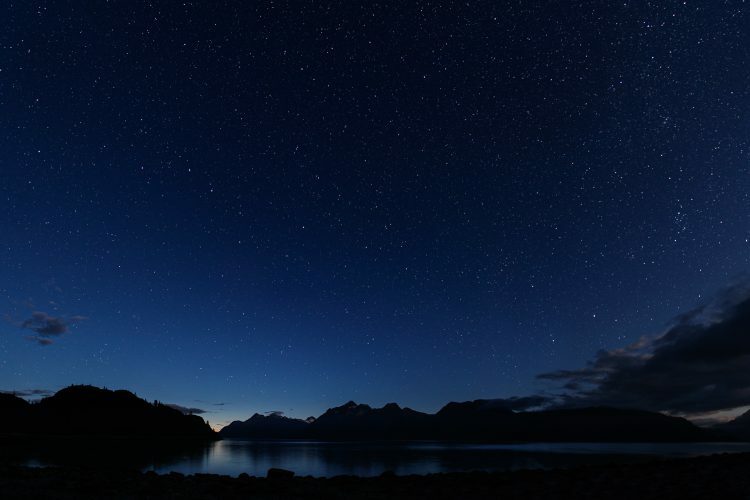 As darkness approaches, the clouds dissipate and move off to the east and north, leaving a beautiful clear evening sky. I love night photography, but the tripod stayed in the car this week because, while kayaks can comfortably carry a lot of gear, there is always a limit. Plus, this is coastal Alaska, a northern temperate rain forest, and what are the odds of having a clear night sky? However, the improbable happened, and what’s a night photographer to do when presented with a gorgeous clear night sky without a tripod? Never, ever leave the tripod at home! Up at 7 after a good long sleep on our comfortable beach. First thing in the morning the sky is overcast, and I wander around, enjoying the morning calm and taking some photos. 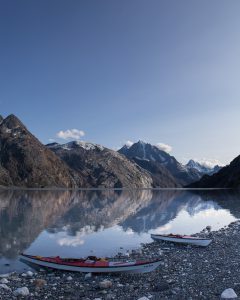 The clouds slowly dissipate as we make breakfast, pack up camp and load the boats, gifting us with another blue sky day. We are all over-joyed at how good the weather has been! After being mentally prepared for days of endless rain, these sunny skies are fantastic. The rising tide generates a current flowing in to the bay, and likewise when the tide is falling the current flows out of the bay. 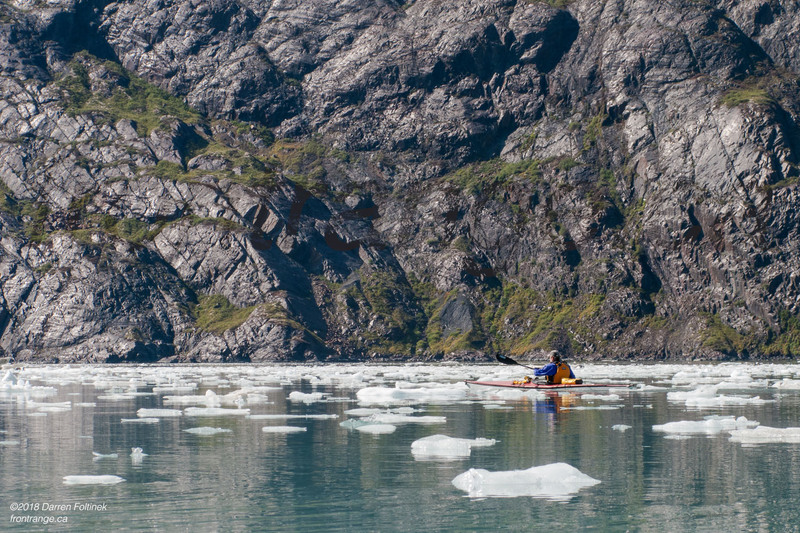 The tide cycle, which arrives 50 minutes later every day, therefore determines our paddling schedule. We are on the water by 10:30, heading west towards our first destination of Lamplugh glacier, finding more icebergs in the water as we approach the glacier. Because the tide is low we can see that the glacier is actually sitting on ground, and only touches water at high tide. 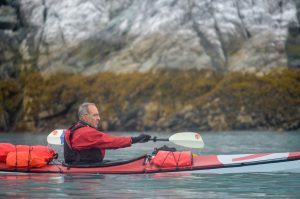 Lots of stranded icebergs are on shore around the glacier but we continue west towards John Hopkins inlet as the light is not very good right now. Fewer marine mammal sightings here but there is a porpoise at one point, arching its back out of the mirror smooth water. As we head towards Jaw Point, the view to the north-west is stunning, with big glacier-carved peaks rising up at least 2000m from the ocean. 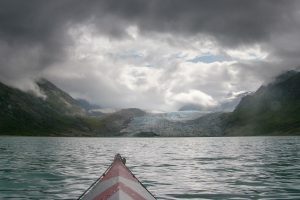 As we paddle around Jaw Point into Hopkins inlet the view becomes incredible, with jagged peaks at the south end of the inlet towering 3000m over a big glacier, stripped with moraine and split by crevasses, that winds down between the peaks to form a huge wall of ice at the head of the inlet, 10km away. 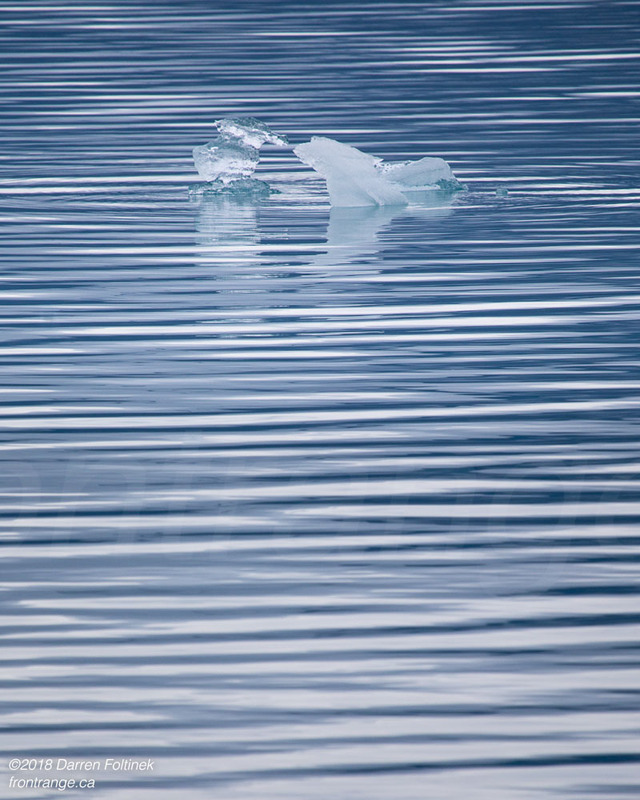 Occasionally the roar of falling ice echoes across the water, which is full of icebergs ranging in size from cubes suitable for chilling a glass to bigger than a house. 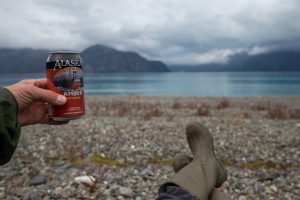 We stop for lunch at the first decent spot, a scree slope of boulders, and scout around a bit to see if this could be a campsite. 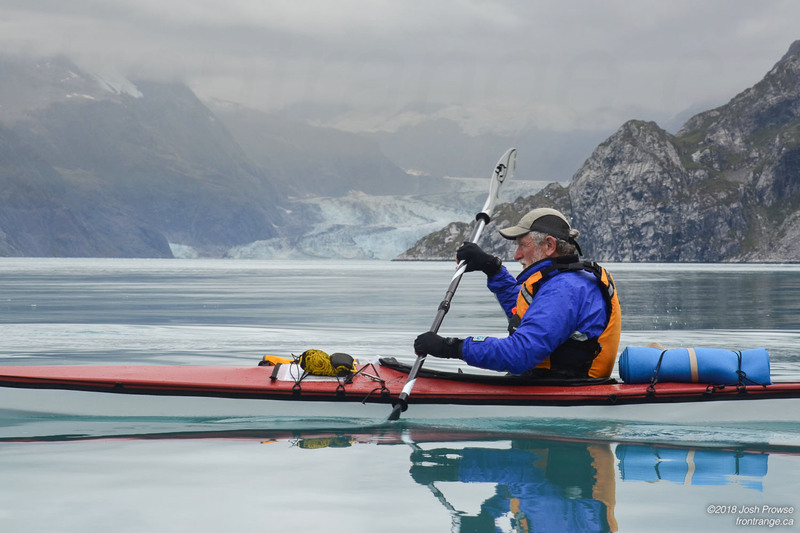 Jim and the John Hopkins glacier. Mts Wilbur and Orville stand guard. 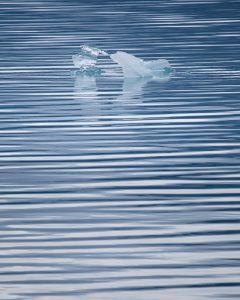 Continuing on up the inlet, the water fills with icebergs as a slight wind pushes a whole field of them out, away from the glacier. 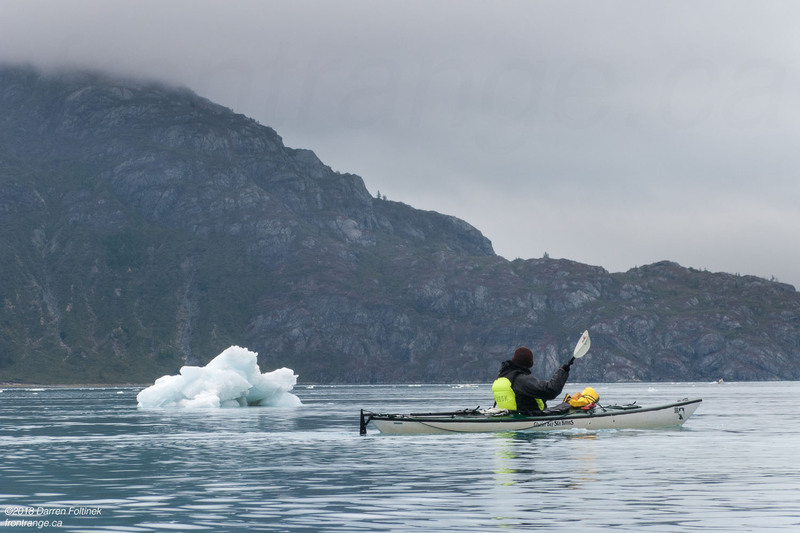 Paddling soon turns into a floating slalom course as we zig and zag around the mid-size (desk) icebergs, occasionally bump into smaller (bread loaf to microwave) ones, and steer well clear of the big (house) sized ones. In the thick of it all, a big one rolls over, slowly and dramatically, about 100m from Josh. We are constantly scanning the shoreline for suitable camp locations and water sources. 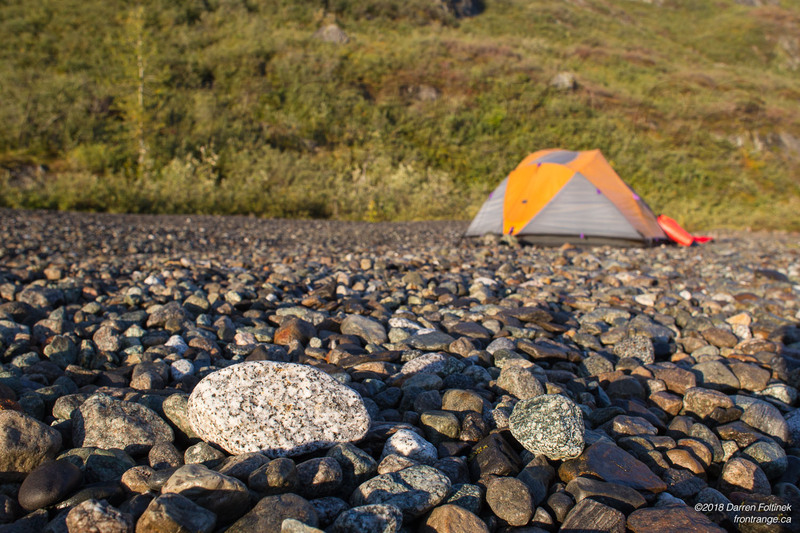 The National Park Service wardens do not suggest campsite locations, in order to avoid creating high-impact zones, and to increase the sense of unspoiled wilderness adventure. 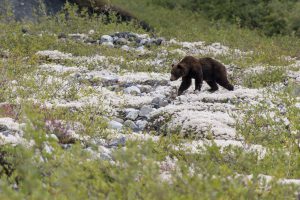 They did advise against camping near creeks that could be salmon habitat, since that attracts bears. 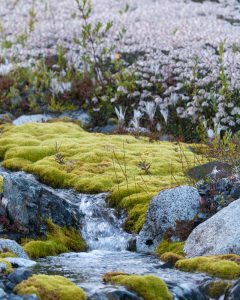 Streams are plentiful here in the West Arm, but we still carry about 2 days supply of water, filtered from the last convenient stream. 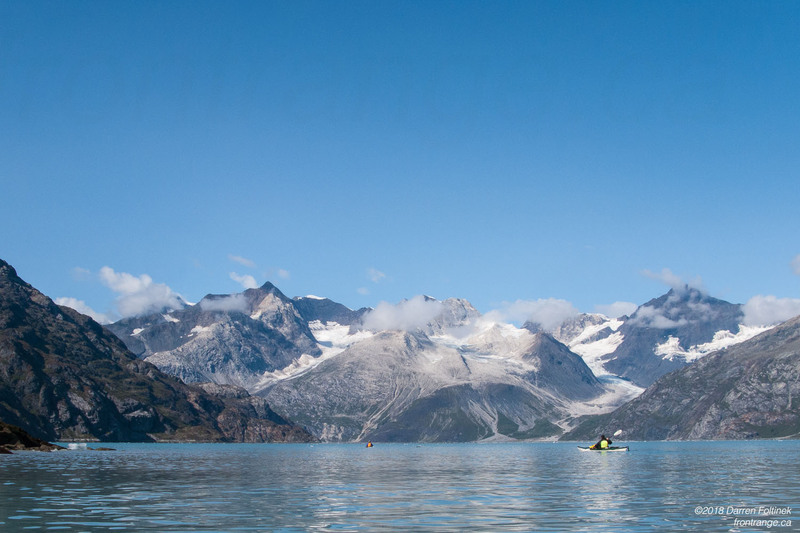 The mountains rise steeply on both sides of the fjord, and flat spots along the shore are very scarce here in John Hopkins inlet, but we see one at the very end of the inlet, close to the glacier. 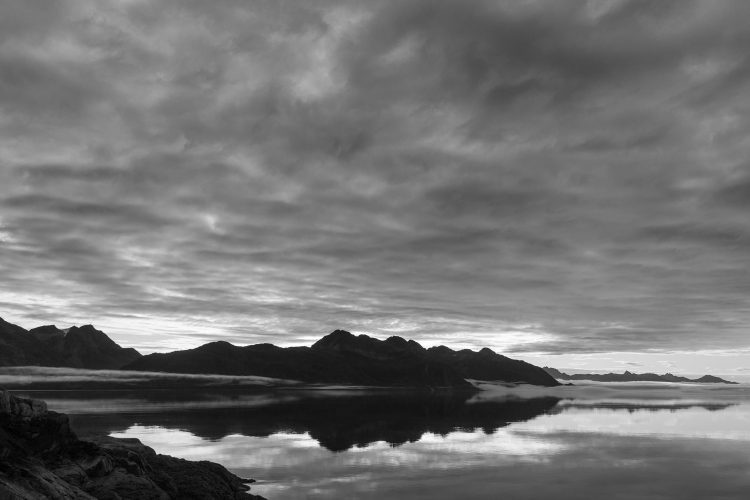 It would be an incredible place to spend the night, but after some discussion, we decide that with so many icebergs in the water, if a storm blows in overnight it could push all this ice up-inlet, trapping us. An unlikely event, given how calm the weather has been, but with pretty high consequences, especially given that our boat pickup, in two days, is the last one of the season. 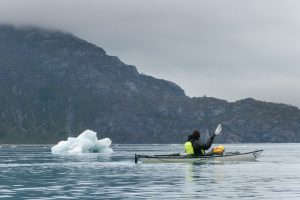 We just paddle among the icebergs for an hour or two, in awe of the beauty and scale of this place where enormous mountains rise 3000m straight from the ocean. 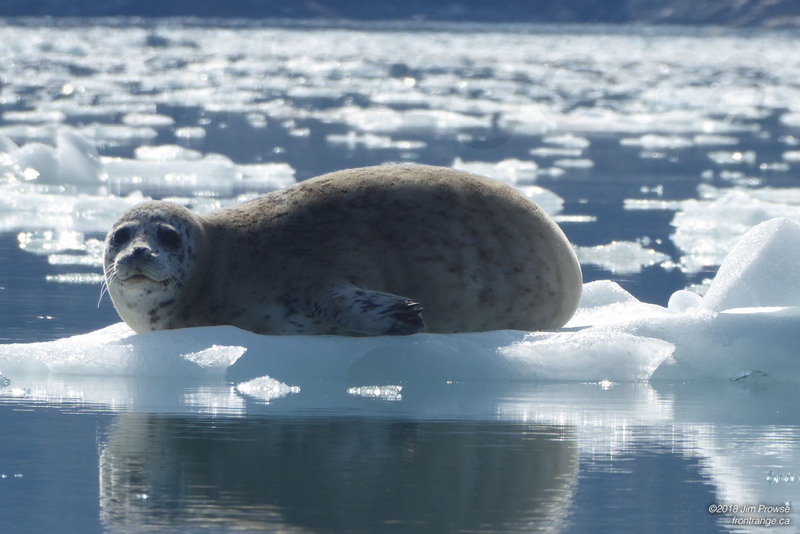 As we get closer to the head of the inlet, we see more seals, several of them resting on icebergs. The park regulations close this fjord to all boats for May and June, when the seals have pups, and only open to power boats in September, so today, the last day of August, we have the entire spectacular inlet to ourselves. Eventually it’s time to head back out the inlet and setup camp. As we paddle away from the Hopkins glacier and back towards Jaw Point at the mouth of the inlet, we leave the area thick with icebergs. The water remains glassy smooth and the sky is blue and clear. 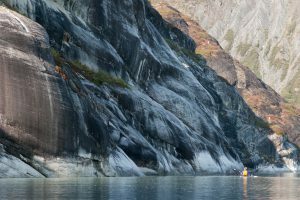 We are following the north edge of the inlet, where steep, smooth, glacier-polished cliffs dropping straight in to the fjord. We pass by “Chocolate” falls, a raging torrent that pours out the bottom of a dirty glacier draped over the mountain a few 100m above the water. 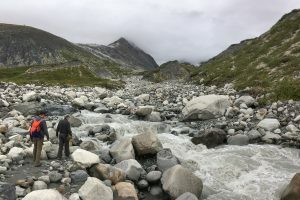 The stream is thick with sediment from the glacier grinding the rock into flour, and where the stream dumps into the ocean it creates a zone of mucky, beige ocean water for several 100m in all directions. Jim sets up camp. Photo: Josh Prowse. 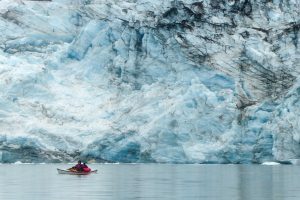 The waterfall and calving glacier are the only sounds in this vast landscape, and we feel very small, paddling our tiny boats along the edge between towering mountains and deep waters. 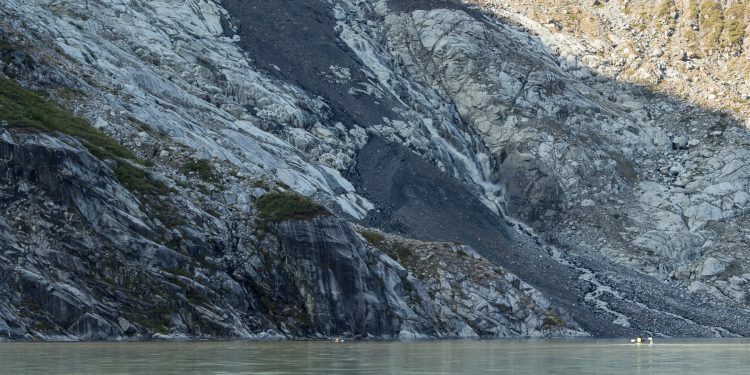 At the beginning of the 20th century, this inlet was completely filled by the glacier, and it’s impressive to see how much vegetation has been able to colonize the bare rock in the subsequent 120 years. It’s also mind-boggling to realize that where we are now was under 100s of meters of ice only 100 years ago! 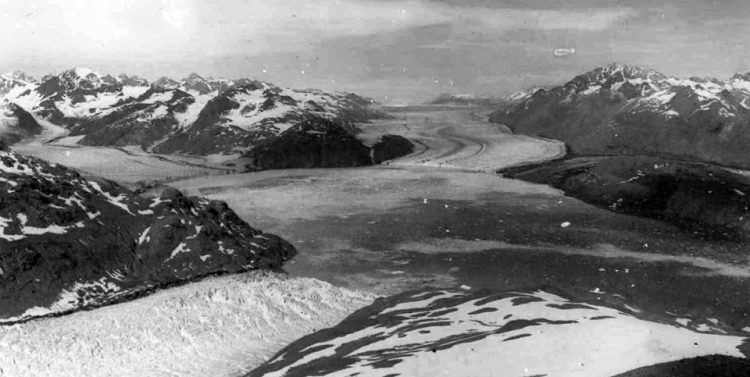 See Glacial Retreat, below, for a photo of this inlet from the early 1900s. 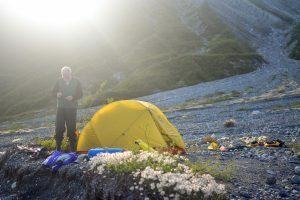 We end up camping on the big moraine field across from Jaw Point, below the Topeka Glacier, with fields of fluffy plants (sedge) spread across a mix of gray sedimentary rocks and stunning black/green flecked white igneous rocks, from golf ball to beach ball sized, with a few giant boulders up the slope. The sky remains clear and gorgeous, and the views up and down the inlet are the most expansive yet. 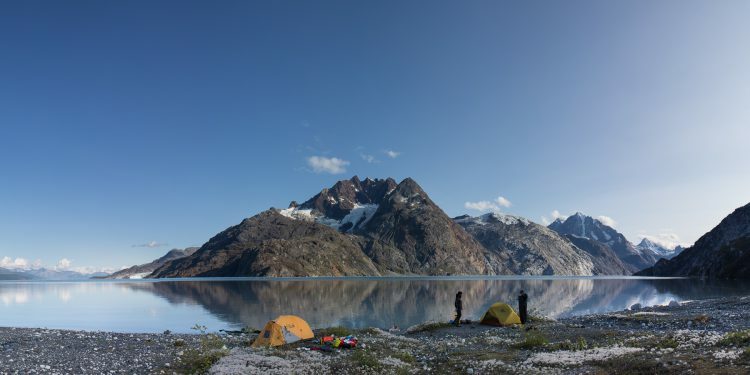 Every campsite seems to top the last in beauty! There’s a rocky point blocking our view of the Hopkins glacier, but the view of Mt. Abbe, with a huge ice-choked couloir splitting it’s north face, is impressive. The north peak of this twin-submitted mountain appears to have seen only a single successful ascent, a very impressive 1991 climb by Walter Gove and William Pilling, who spent two days approaching by kayak, and survived the incredibly dangerous and dynamic nature of these mountains, with massive rockfall, surging glaciers and unstable snow. The sun goes down behind the peaks towering above us to the west, the sky stays clear and the water is glassy calm. Once again feeling incredibly lucky about the weather. Another clear night and I am forced to stay up late (10:30) capturing the night sky, without a tripod. Again I improvise a tripod out of three rocks, bracing the camera by hand and leg against the rocks. It’s a bit frustrating, as I have to check every exposure for camera movement, and I had to capture 20 10-second frames to get 5 usable ones for this panorama. Some clouds are moving in from the east, and by the time I capture the last image, with the Milky Way just becoming visible, the clouds are already overhead. Night photo session over, time for bed. Up at 7:30 after a fairly late night. Jim and Josh are already up and I’m feeling tired and dopey this morning. The sky is overcast, and there’s a feeling of rain in the air. 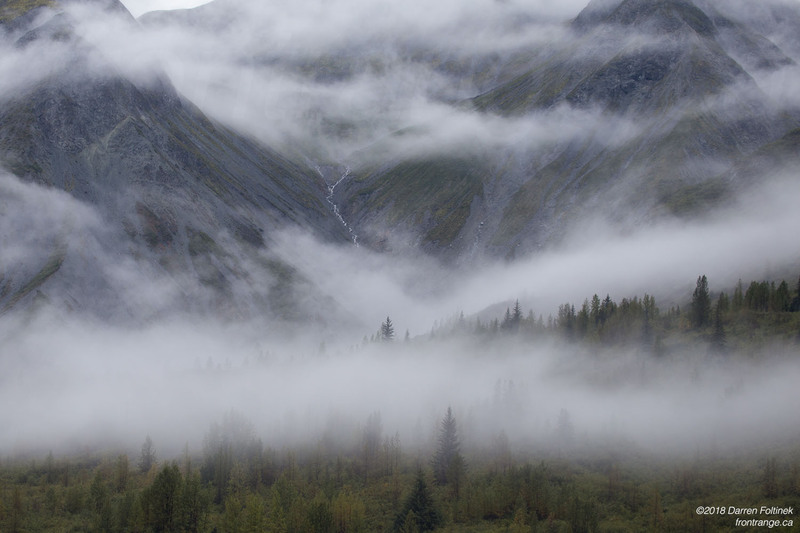 But then, as we’re having breakfast, the clouds start lifting, and spots of sun light up the gorgeous landscape. Once again the wind is non-existent, and the water in the inlet is beautifully calm. The constantly changing weather here really adds drama to an already incredible landscape. We don’t have far to paddle today, and over breakfast we talk about paddling back up John Hopkins or going for a hike this morning. The hike option wins out, in order to get the view from up high, and also just for a change of activity. 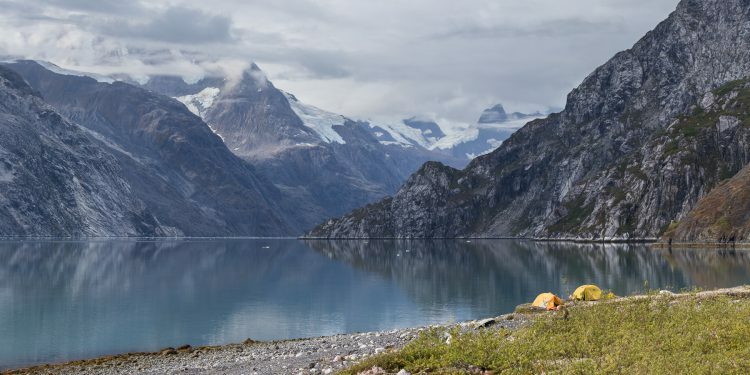 We decide to pack up camp first, and as we are working, Josh sees a big brown bear strolling purposefully across the boulders, perhaps 150m away, heading up the moraine. We make some noise to let him know we are here, but he pays us no attention and before long starts running up the steep slope of boulders, heading up towards the ridge to our left. It’s amazing to see how fast this bear can move up-slope in rough terrain. The hike turns difficult as we come across and then follow a raging creek full of giant boulders, looking for a place to cross. 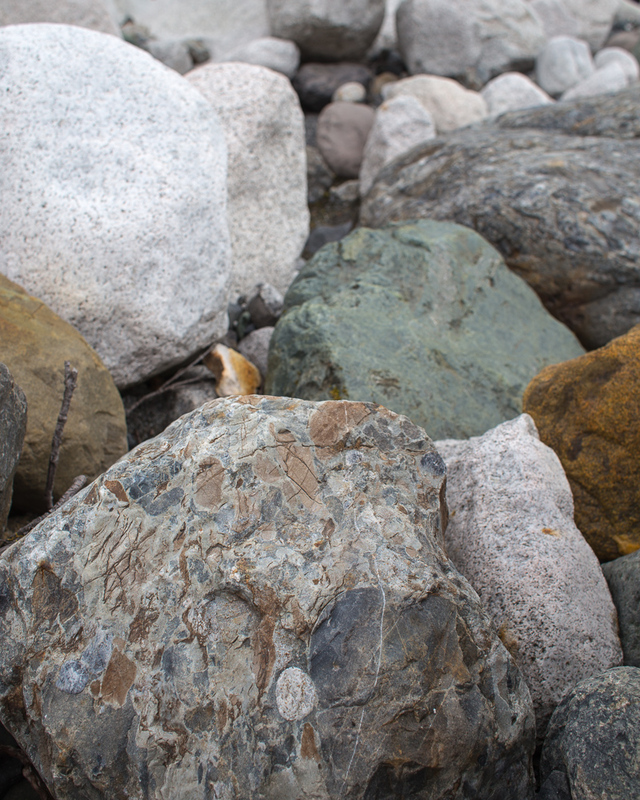 Many of the boulders are of white igneous rock with black flecks, but others are grey limestone, a scattered few conglomerates, and a few green. Amazing raw feel to this fresh moraine, carved by this roaring stream. The stream is too large and violent for us to cross, a reality which shuts down our plans to hike up the right-hand ridge, so we decide to climb one of the lateral moraines in the valley instead, just to get an elevated view into the fjord that’s been our home for the last several days. As expected, getting up the moraine is a steep, loose scramble followed by some of the most horrible bush-whacking I have ever done, battling our way through dense, 2m high shrubs at the top of the moraine, trying to find a lunch and view point. But the view of the fjord and Lamplugh glacier was worth the struggle. Sort of. 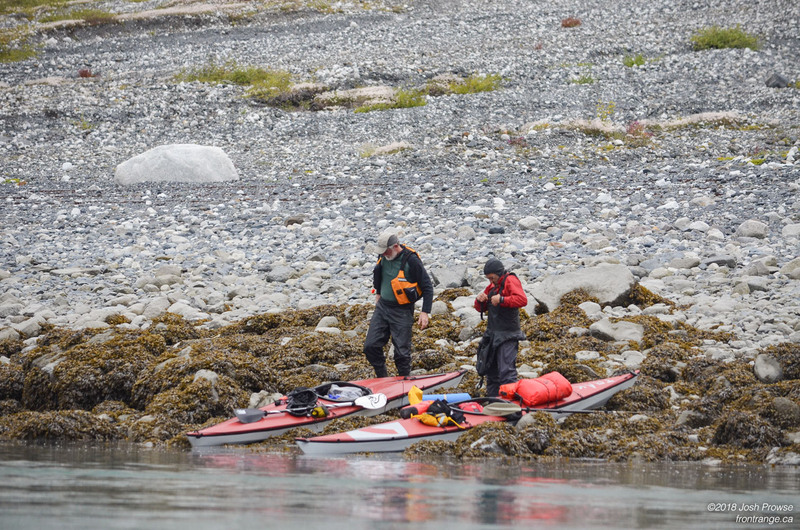 Jim and Darren getting ready to launch at low tide. Photo: Josh Prowse. 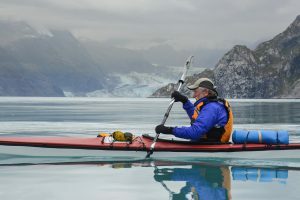 Jim crossing the inlet, with Hopkins glacier behind. Photo: Josh Prowse. 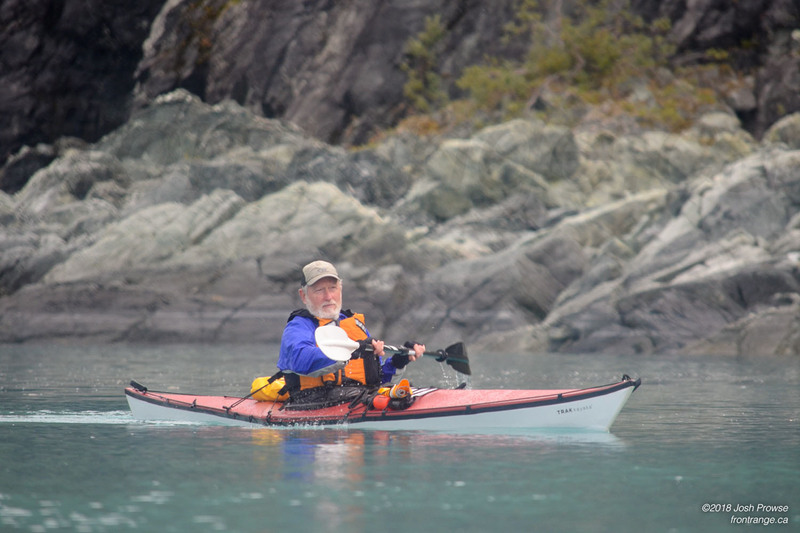 After battling our way through the bushes at the top of the moraine, scrambling back down the steep side, and working through the big boulders back down the creek, it feels good to get back on the water. 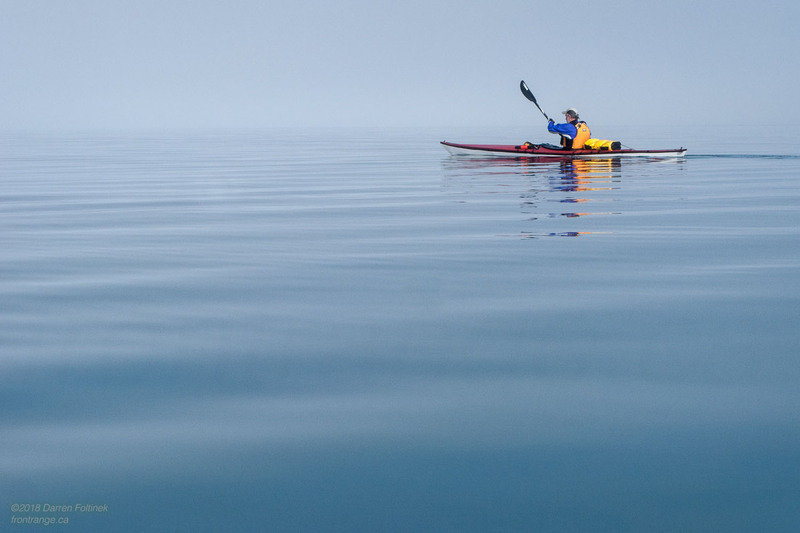 It was great to stretch the legs, but paddling is so much smoother than walking! We wait for a giant cruise ship to pass, then cross 2km of smooth, open water to get to the south side of the inlet, back on the Jaw Point side. The clouds have dropped down again, and the some light mist is in the air. 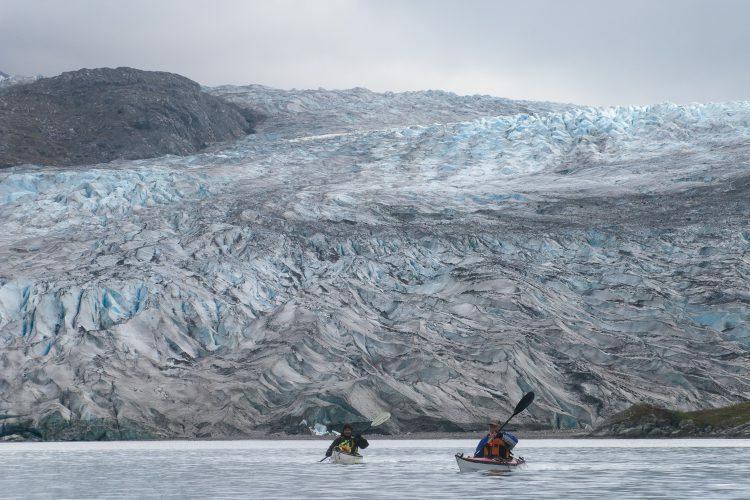 As we paddle east, we soon come to where the 20km long Lamplugh glacier meets the ocean. The glacier looks much better today, under the cloud and at high tide, than it did two days ago when it was back-lit by the sun. 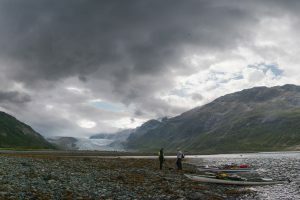 When the tide was low, we could see that the toe of this glacier, unlike the Hopkins glacier, is sitting on land, and therefore is not actively calving into the ocean. 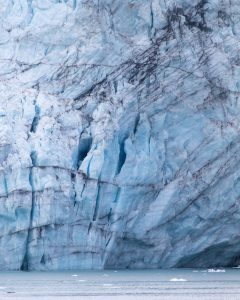 Despite the relatively quiet nature of this glacier, we still give the shattered ice face healthy respect, and keep a safe distance from it. 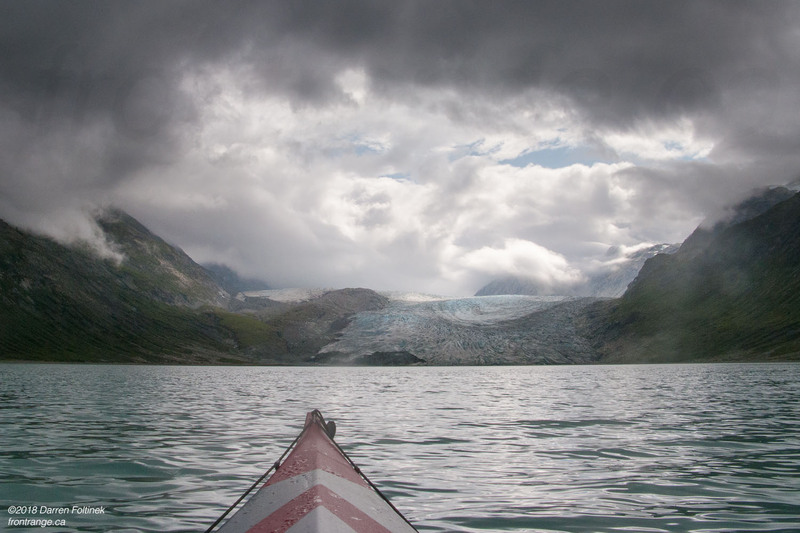 Looking up at a glacier from a tiny sea kayak is really the perspective that an ant has on the world. Unfortunately we were not able to get a higher view of this spectacular place, but Jim Bell has some great aerial photos of Lamplugh glacier, plus the rest of Glacier Bay. Glaciers function as enormous conveyor belts that move vast quantities of ice and rock through a landscape, carving out U-shaped valleys and leaving behind great deposits of rock. 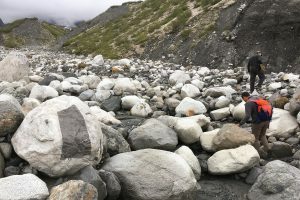 The rock that a glacier carries is not just scraped up from the valley bottom, it also gets dumped on to the glacier by the surrounding mountains. This massive landslide spread an estimated 150 million tons of rock over 10km of the upper Lamplugh glacier in July 2016. 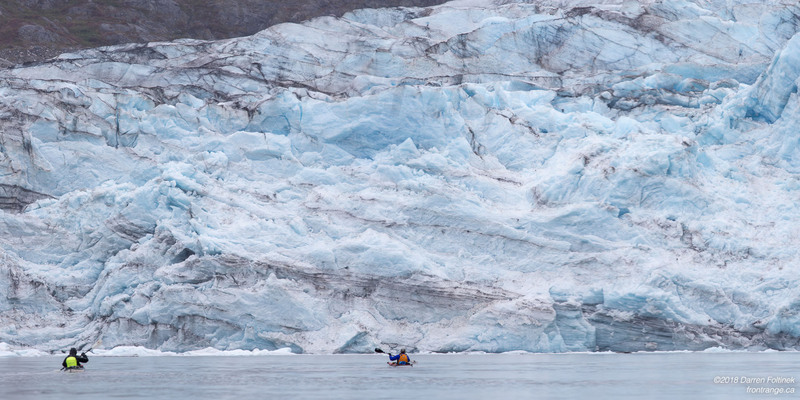 Being in a tiny boat, so close to this giant wall of ice really fills you with awe, a sense of vast forces and time, and a feeling of smallness and humility. But it’s not a place to hang out for a long time, and after about 30 minutes we continue paddling east, back toward Ptarmigan creek. The clouds have descended again, and we paddle along the shore for a few kilometers in light rain before arriving back at Ptarmigan creek. It’s gently raining as we set up our tents, change out of paddling gear and get into dry clothes. Partly just because we’ve been carrying the thing around for five days, we decide to set up the kitchen tarp, which will give us some shelter from the rain while we cook dinner. Tonight, our last night here, is only the first time that it’s rained enough to need the tarp, and again we feel incredibly lucky to have had such good weather on this trip. As usual, the kitchen area is about 100m from our tents, and the food cache is even further down the beach. The parks service requires, and provides, bear-proof food canisters that all food and garbage must be stored in. 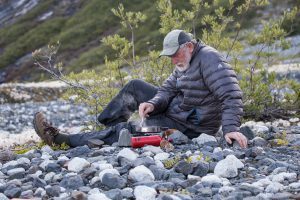 Having the tents, food storage and kitchen so far apart certainly adds a lot of walking, and time, to the day, but is absolutely critical so that bears never learn to associate humans with food. 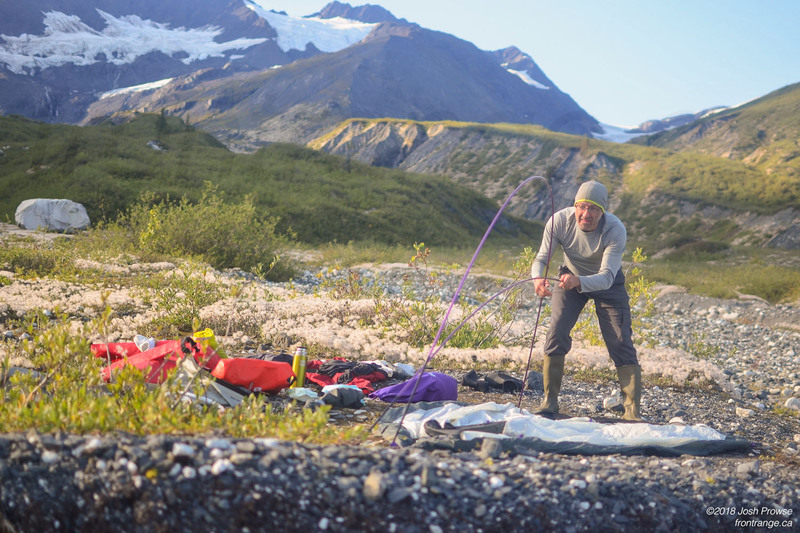 This camping discipline, maintained by all campers here, is what has allowed us to visit this pristine wilderness and have several peaceful encounters with bears over the last few days. After yesterday’s rainy day and evening, we are surprised and thrilled to wake up to a stunning blue sky this morning. Our morning is completely relaxed, as the tour boat pickup is not scheduled until 12:30. Lots of time to slowly make breakfast (what goes in the oatmeal today? ), dry things out, slowly pack, explore the beach, take photos, and lounge in the sun. 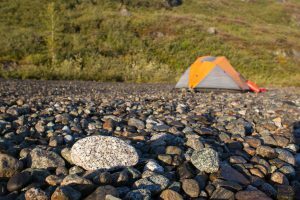 One of the more subtle things about this place that has really fascinated me is that all the beaches we have camped at have very different rocks. 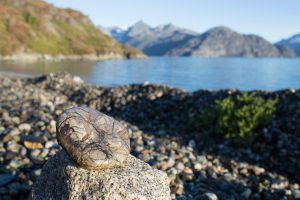 This land was buried under massive glaciers only 300 years ago, and the beaches here are composed of rocks that were glacial moraine, rocks that have been transported and mixed by the glaciers as they flowed down what is now Glacier Bay. The tour boat shows up as promised, puts a ladder over the bow for us, and we pass our gear up the ladder and climb on board. 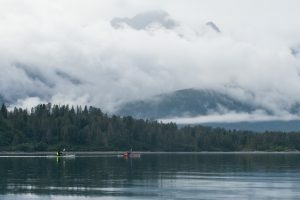 We then tour back to Hopkins inlet, which allows us to get great views in today’s weather, which of course is very different from the weather this morning, and yesterday. Hopkins inlet and glacier looks stunning today. The big peaks behind it are Mt. Orville, 3199m (C) and Mt. Wilbur, 3298m (R), towering over 3km above the ocean and only about 12km away from where the Hopkins glacier meets the water. Despite the 1000s of people that visit this park annually, mostly by cruise ship, these huge, stunning mountains have seen very few climbers. Mt. Orville has only seen one summit, in 1995, by P.Kaufmann, S.Carroll, P.Simmons, all of whom died in an avalanche while descending. As far as I can tell, Mt. Wilbur has only seen a single successful summit, in 1976 by G.Markov, D.Jones,C.Gerhardt and C.McKibben. Of course, there are a (very) few people who keep trying to climb these remote and difficult peak, like this 2011 attempt on Mt. Orville. Access information and history of mountaineering in the Fairweather range is available from the National Parks Service. 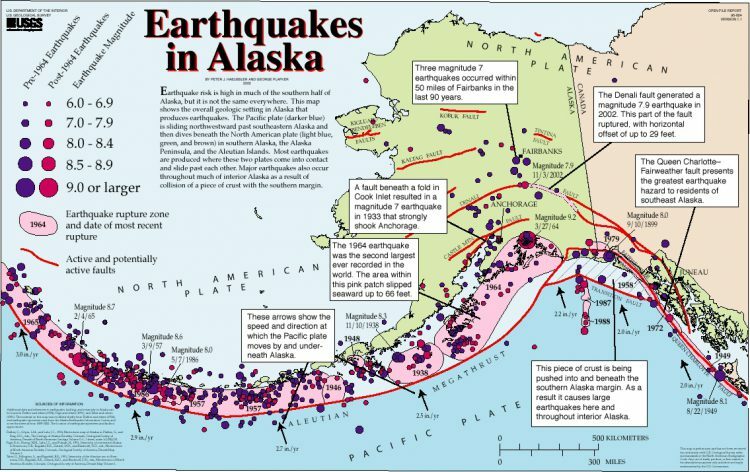 The extremely complex geology of south-east Alaska is the result of sitting on a tectonic boundary, where for 10s of millions of years the Pacific plate has been colliding with, and being pushed under (subducted), the North American plate. This collision occurs at a rate of a few centimeters a year and causes numerous large earthquakes. Some of the largest tsunamis ever documented have also occurred in Alaska, usually triggered by a landslide that dumps an enormous volume of rock into a narrow fjord. This excellent Alaska National Parks Service video documents the October, 2015 landslide that dumped about 200 million metric tons of rock into Taan Fjord, triggering a 150m tall wave that scoured the shore. And in July, 1958, a magnitude 7.8 earthquake along the Fairweather Fault released 30 million cubic meters of rock into the head of the inlet, creating a tsunami that swept through Lituya Bay, which is on the Pacific Ocean side of Glacier Bay National Park. There were six people in the bay at the time, four of whom survived this incredible event. When two tectonic plates collide, pieces of one plate are often accreted to, or sutured, onto the other plate. A geologic terrane is this fragment of crust, and the boundary between it and the adjacent crust is usually a fault line. 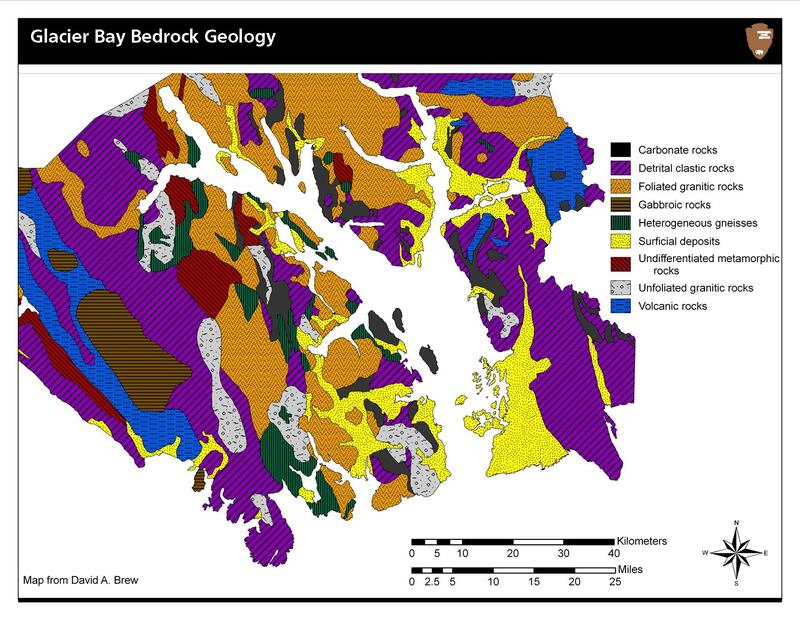 As seen in these maps, Glacier Bay is composed of four terranes, with numerous igneous plutons visible at the surface. This earthquake map clearly shows the boundary between the Pacific plate and the North American plate, the ongoing collision that has formed the St Elias mountain range and the volcanic chain of Aleutian Islands. 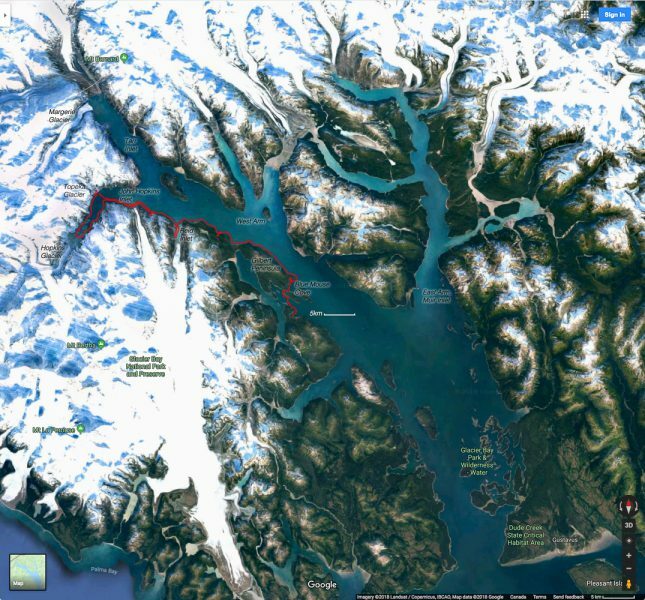 In this Google Earth satellite view, the Fairweather / Queen Charlotte fault line can be seen as the dramatically straight line running from the head of Lituya Bay, roughly parallel to the coast, heading north-west through Alsek Lake. Topeka glacier, right, and Jaw Point, foreground left. The light-coloured granite pluton is clearly seen in center of the image. At our Strawberry beach camp I first noticed beautiful white igneous rocks with flecks of black or brown mineral crystals, mixed in with a wide variety of other rocks by glacier transport, and then rounded by glaciers and water. As we worked our way up the inlet (east) these brilliant white rocks became larger and more prevalent, and I was wondering where this white and black flecked mountain was that was the source of these rocks. 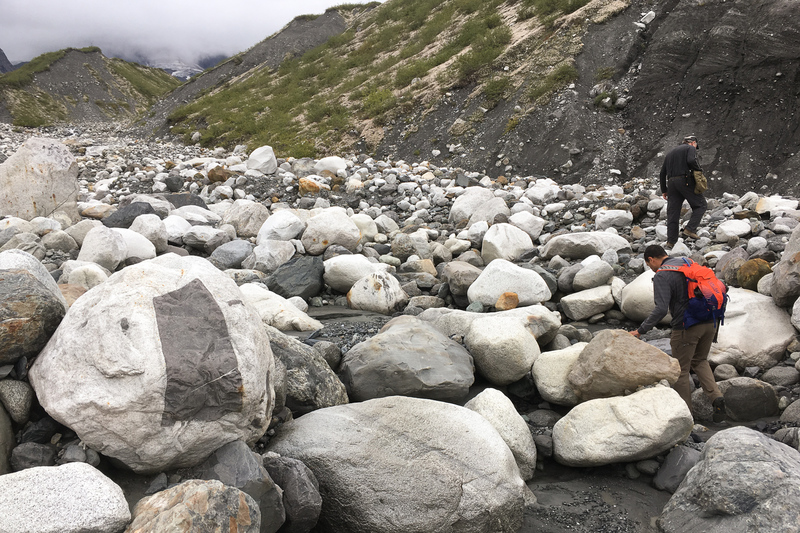 When we camped below the toe of the Topeka glacier the moraine / beach was made up almost entirely of the black-flecked white rocks, and gray sedimentary (limestone? 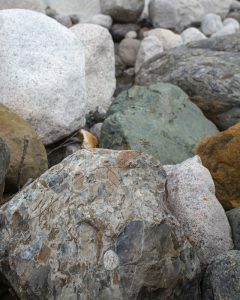 ), and there were giant bus-sized boulders of the white rocks lying about. The pluton that is the source of these brilliant white rocks must be close, and actually it was immediately above us, but out of sight until we could get further away and get the bigger perspective. Geologic mystery solved. 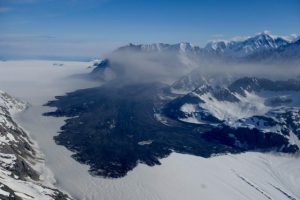 In this panoramic view of the region around Topeka glacier, there are very dark rocks to the right and immediately to the left of the toe of the glacier. 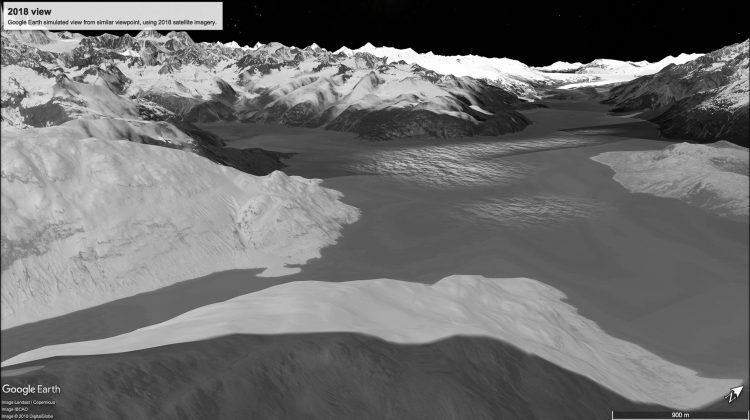 In the center of the image is a large cirque (bowl) of very light-coloured rocks, with a small glacier in the middle. This light-coloured cirque is the bright white granite pluton. Google Earth rendering from the same location. 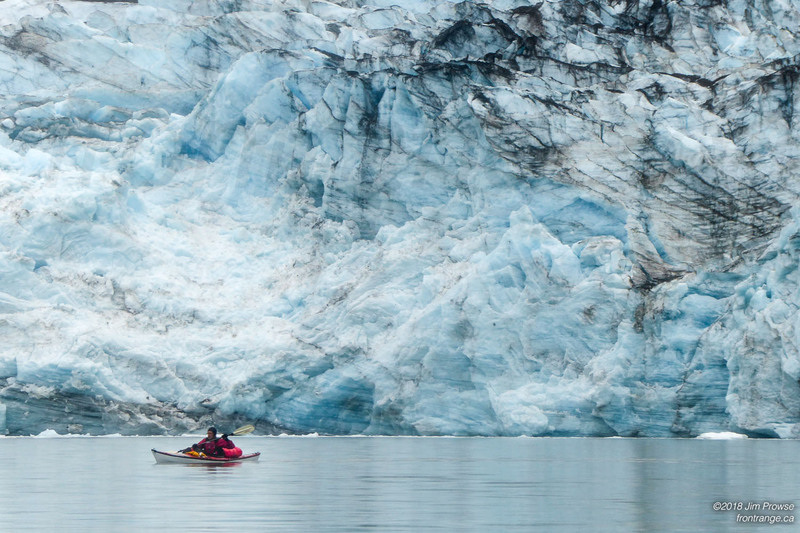 In the 1600s there was no Glacier Bay. Where the mouth of the bay is today was a broad valley, with two rivers flowing to the sea that supported the Huna Tlingit people in villages. The merged Grand Pacific and Muir glaciers were at the north end of the valley, and advancing. 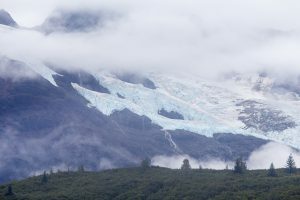 By the 1700s the glacier had advanced through the valley, destroying it and the Tlingit villages, forcing the people to flee across Icy Straight and settle in the village of Hoonah. 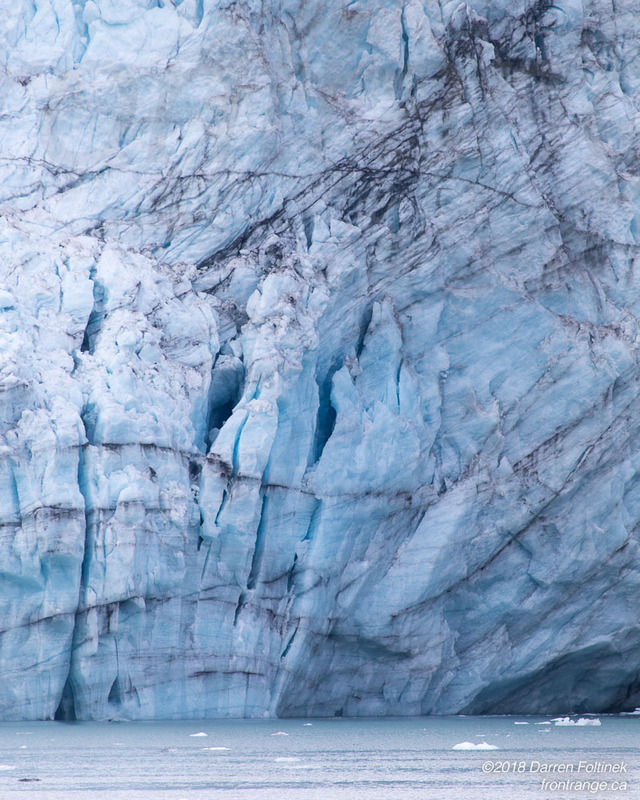 The glacier reached it’s maximum extent in 1750, pushing its toe far across Icy Straight. In the process, the glacier dug out the valley to a depth of around 60m. 50 years later, when Captain George Vancouver’s expedition sailed through, the glacier had already retreated 8km back up the newly-formed bay, and 100 years after that, in 1880 when John Muir came through, the glacier had pulled back 70km from the mouth of the bay. Today the Muir, Carroll, Margerie, Hopkins, Reid and other tributary glaciers that were previously merged with the Grand Pacific glacier are all over 100km from the mouth of the bay. 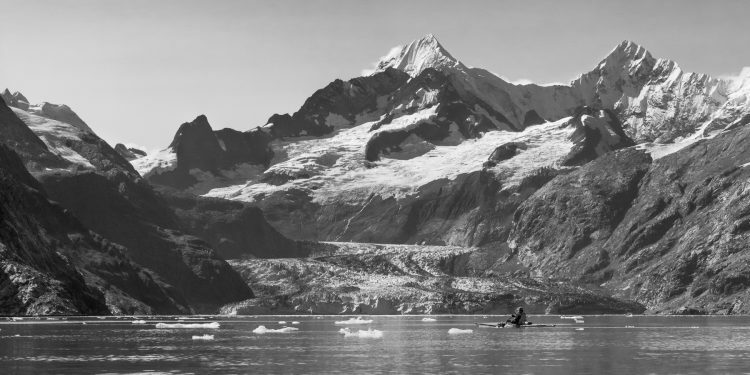 Compare these photos of Glacier Bay over the last 140 years. Advancing glaciers in the 1700s erased all plant and marine life from the inlet as they plowed their way towards the ocean. 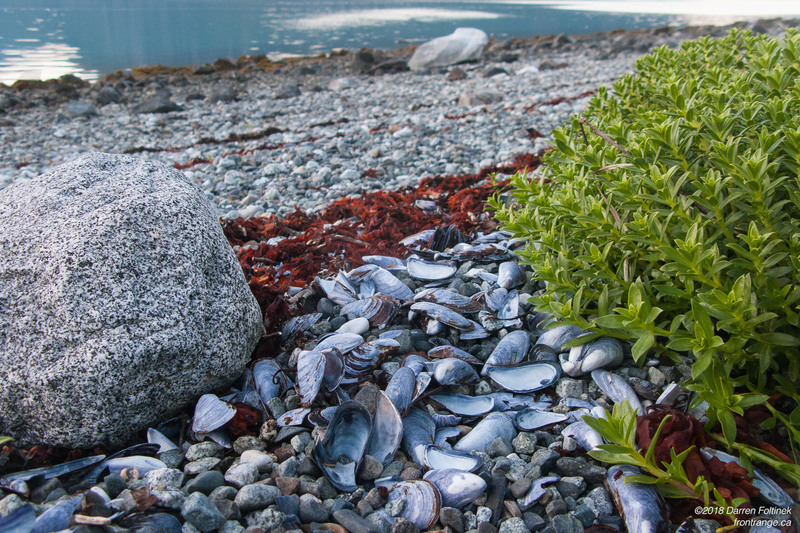 As the glacier retreated in the late 1700s, life repopulated the newly-exposed land . 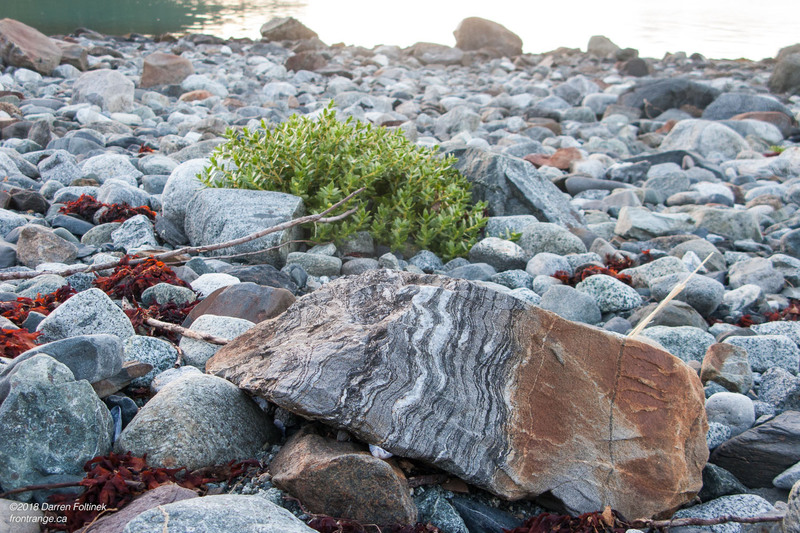 The mature spruce and hemlock forests around Barlett Cove, at the mouth of the bay, are only 200 years old. Around Gilbert Peninsula, where we started our kayak trip, the forests are less than 150 years old. Moving further up the bay, most of the vegetation we saw were shrubs and tall bushes, and as we approached Tarr and Hopkins inlets there were very few trees, since the shoreline land was under ice as recently as the 1870s. 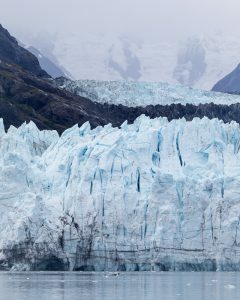 Glacier are massive and heavy, and because the Earth’s crust is floating on the mantle, that weight of ice lowers the elevation of the land. When the glaciers melt and retreat off the land, the land slowly rises again, a process known as post-glacial rebound. 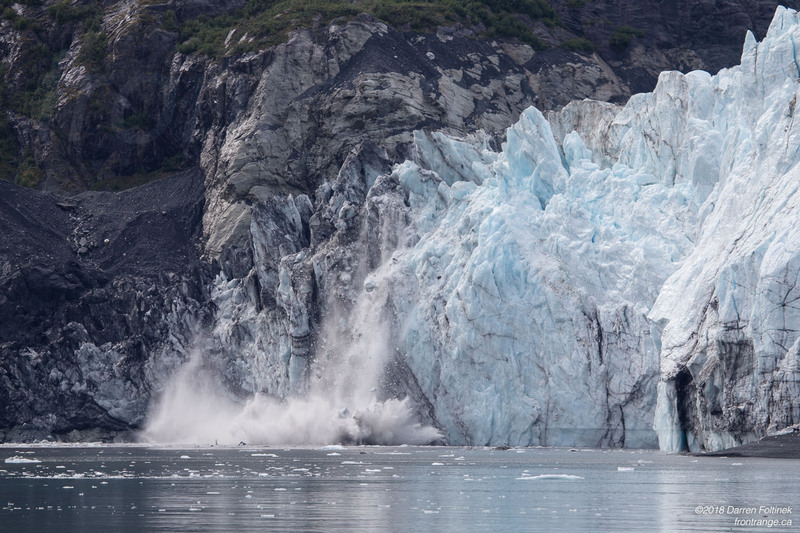 Glacier Bay is currently rising at up to 30mm/year, which is one highest rates of glacial rebound in the world. While this may not sound like much, it adds up to about 3m rise over the last 100 years. 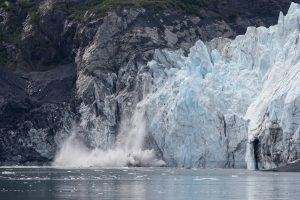 This rebound was measured in recent studies; Rapid uplift of southern Alaska caused by recent ice loss and Post Little Ice Age Glacial Rebound in Glacier Bay National Park and Surrounding Areas. Tidal bulges on both sides of the Earth. Image from NOAA. If you live on some coast of this world, you probably already know why there are two high tides and two low tides a day, and why they vary slowly over a month. But Jim, Josh and I are all from middle of the continent, far from any ocean, and so we all scratched our heads a bit over this. The primary force driving the tides is the Moon’s gravity. Not just the pull of the Moon, but the difference between the pull of the Moon on the side of the Earth facing the Moon and the side away from the Moon. This difference in gravitational pull causes the oceans to bulge out on the side of the Earth facing the Moon, as well as the side away from the Moon. Essentially, the Moon pulls on the center of the Earth, which causes the Earth to accelerate towards the Moon. But, it pulls harder on the side facing the Moon, which causes the water to bulge out slightly. It pull less on the side away from the Earth, which is “left behind” by the acceleration of the Earth towards the Moon. 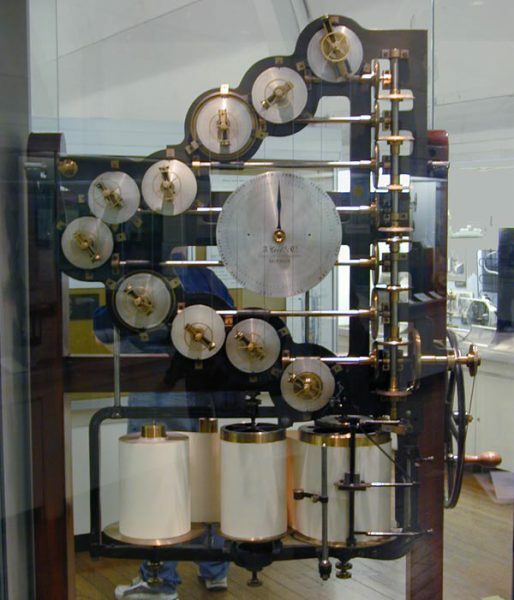 Lord Kelvin’s tide prediction machine of 1872-73. Source: Wikipedia. The same effect applies to the Sun’s pull on the Earth. But the Sun’s gravitational difference, from one side of the Earth to the other, is smaller than the Moon’s. This video explains the physics very well. The day-to-day variation in tides can then be explained as the result of the gravitational interactions with the Moon and the Sun, as well as the more subtle variations caused by the changing distance and angle of the Moons orbit. NOAA has several pages explaining the orbital cycles that affect the tides. Predicting the tides has been a problem that humanity has struggled with for centuries, from Ptolemy in ancient Greece to Johannes Kepler and Galileo Galilei in the 1600s. Sir Isaac Newton was the first scientist to provided a correct explanation for the tidal force, based on his laws of gravity and motion, published in 1687. That was extended by Daniel Bernoulli, who explained how the tidal force would affect a body of water, and further extended by Pierre-Simon Laplace, who in 1775 developed the Dynamic Theory of Tides. Harmonic analysis was applied to tide cycles in the late 1800s, eventually leading to the identification of a series of tidal wave frequencies and amplitudes, due to the Moon and Sun’s orbits and the Earth’s rotation, that can used to accurately predict tidal forces. Tide-predicting machines, very precise and beautiful analog computers, were built in the 1800s. These tidal components form the Doodson numbers, named after Arthur Doodson, a British oceanographer who developed this practical method for tide prediction, published in 1921. Historical side note; one of the most important dates in the 20th century was set by tidal predictions, based on Doodson’s calculations. The D-Day invasion of Europe was chosen to be June 6, 1944, because that provided the best combination of a full moon for a pre-dawn arrival, and an incoming tide, mid-way between low and high. Another question we pondered but never came up with an answer to is: why does the height of tides vary so much around the world? 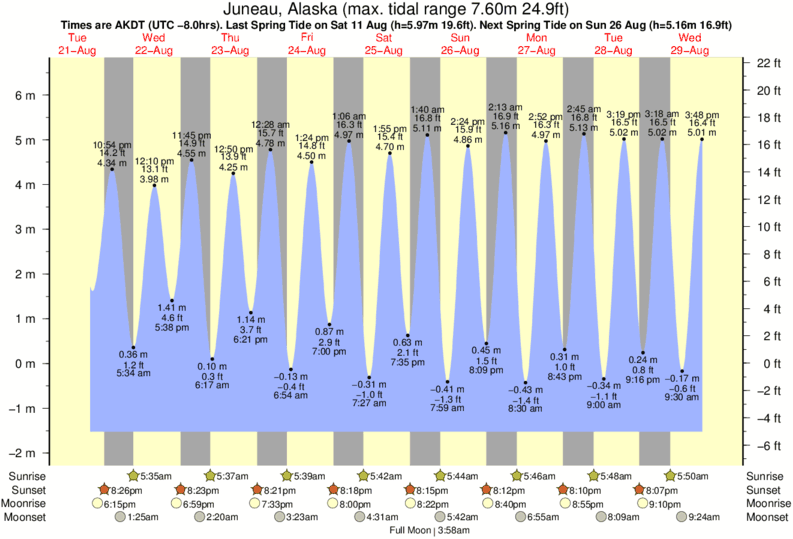 In Juneau the tides can be over 7m. In the Gulf of Mexico and Western Australia however, they are only about 1m. And the highest tides in the world are in the Bay of Fundy, on the Nova Scotia / New Brunswick border in Canada, at over 16m. The reason for this is that the water in an ocean basin (Atlantic, Pacific, Indian) basically stays in that basin. As the gravitational bulge swings around the Earth every 24 hours, the water in each ocean basin moves in a circular motion, like soup in a bowl. The cycles are made more complex because the water goes clock-wise in the southern hemisphere and counter-clock-wise in the north. Here are excellent visualizations of these global tide cycles, from the NASA TOPEX/Poseidon satellite. But wait. 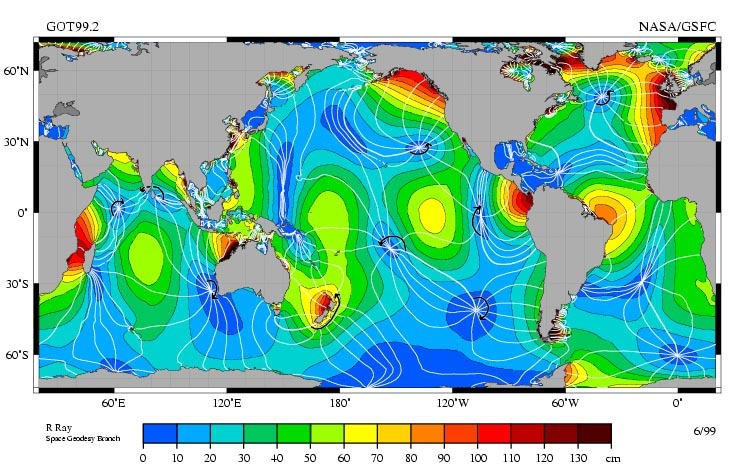 This map only shows tide heights up to 1.5m. How do you get a 15m tide from a 1.5m wave? The answer to that is because the tide is essentially a very low-frequency wave, with a 12 hour period, and that wave interacts in very complex ways with the shore and the ocean bottom. All that from asking the question of “where should we put our camp tonight?”. Because waking up with your face in the ocean is no fun! All week we have been in the shadow of the massive Fairweather Range of mountains. 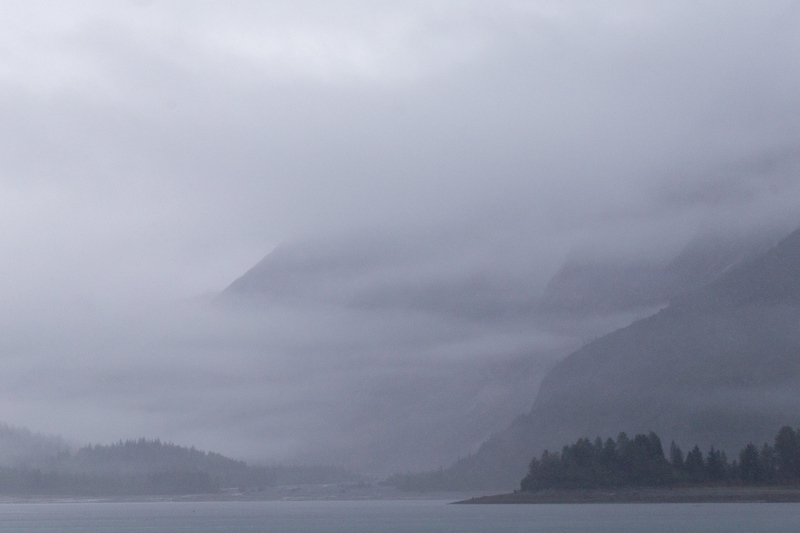 As the ferry sails from Gustavus, heading for Juneau, once again the morning fog clears and we have a good view of these massive peaks, climbing up to 4600m above the ocean. Panorama of the Fairweather range, from the Gustavus ferry. Scroll image to view panorama. 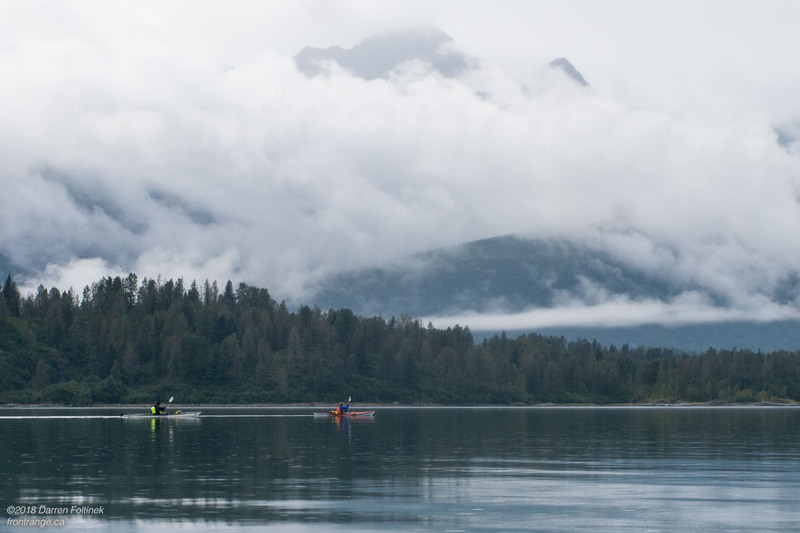 Thanks, Alaska, for the excellent weather, smooth water and stunning, friendly wildlife!